When wintry winds blow fierce and cold, what’s a person to do? Why, curl up with a good magazine, of course. And January certainly brought us an exceptional array to choose from. Magazines who discovered the print life after being digital only, like “Dun” magazine, and companies like Away luggage that there is life “Here” as you travel there. Also there were “Bursts of Color” for the New Year, and “Gin” for those of us who needed a little warming from the inside-out. From the “Hungry Girl, ” Lisa Lillien’s own kitchen filled with recipes and advice, to “Kitchen Toke,” where one could spend the first long winter month of the year learning how to cook with cannabis; these new batch of titles January cooked up were deliciously diverse. And two honorable mentions, “Reputation”, a magazine in two volumes for the ultimate Taylor Swift fan, and “Paul Ryan,” an unofficial title all about, who else, Paul Ryan, follow our January list. And while not frequency titles, these deserve to be highlighted because the power of the printed word and the dynamic effectiveness of a magazine’s cover spans the spectrum from celebrity-hood to politics (unofficial though that political title may be). So, enjoy these great new magazines that gave us hours of reading pleasure during the cold days of January, and will continue to entertain us for many months to come. See you soon for a Fabulous February! I spoke with Will recently and was fascinated by many of his ideas and suggestions when it came to business models, advertising, and the fact that he believes in Harvard’s Michael Porter’s theory that one shouldn’t compete to be the best at something that already exists, but instead, one should strive to compete to be different. Compete to find something that no one is doing and then do that better than anyone else does. Enter Alta. The magazine is dedicated to speaking to the local communities of the area that Will felt wasn’t being included in any conversation that already existed. So, being uniquely different was organic for the brand. He is a firm believer in print, yet has a definitive desire to serve the online reader as well, and definitely represents the Print Proud Digital Smart model excellently. His staff gets full credit from him when it comes to editorial talent and factuality. In fact, he also follows mathematician, Don Knuth’s lead when it comes to monetarily rewarding readers for pointing out typos and factual errors in the editorial of the magazine. He has a penchant for exactness that in this age of “fake news” and “alternative facts” is greatly appreciated. 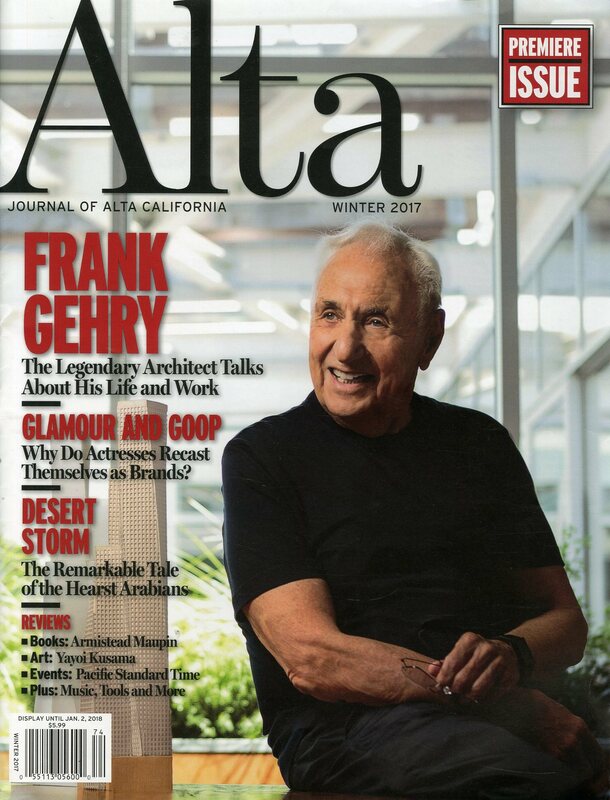 So, I hope that you enjoy this Mr. Magazine™ interview with a man whose greatest wish for his new publication is that he can make the experience of reading the magazine a little bit like the experience of actually living it, William R. Hearst III, editor and publisher, Alta Journal of Alta California. On his idea of the new media model for Alta: My notion of the old media model is, and you can exaggerate here; the extreme of the old model is that you’re going to have a genius editor, William Shawn, or maybe you have Helen Gurley Brown, or somebody who is able to answer every question. And then the staff basically runs around executing that plan. At the opposite end of the spectrum, you have a complete, sort of blog community, every opinion is equal; you’re not really talking about facts; you have a comment section of the average website. And I thought there should be something in the middle where you had people who really wanted to work at being editors. I like to feel that our readers aren’t a mailing list, that it’s an actual community. And the community could disagree with us; the culture could change and we would need to change with it. So, I thought of a more dynamic, open model; a little more democratic, but not 100 percent democratic either. On his challenge to readers that if a factual mistake or misstatement is found in the printed magazine, they will receive $10: I stole the idea from Don Knuth who wrote the print bible of software. He was writing technical articles where mistakes and typos meant that the software didn’t work or what was stated was wrong, but I just felt like we should challenge ourselves. And I worked for a guy when I was younger, the editor of the editorial page of The San Francisco Examiner, and his view was that there should be no typos on the editorial pages. There could be typos in the newspaper because you’re on deadline and you’re in a hurry, but in the things where you were really putting the brand of the owner on the page, there should be no typos. On why he insisted on a print component for Alta: There are two reasons really and one of them is a content reason and one of them is a business reason. The content reason is that I wanted to deal with things that last a little bit longer. I was thinking about the people that I know: writers, photographers, editors; these are people who often write books, that take some time to write something. I was less interested in immediacy; I wanted things that had a lasting quality. And one reason print attracted me was I wouldn’t be yoked to the daily cycle of doing a website or a blog, because if you’re doing the Huffington Post or you’re doing these sites that have to be updated every 24 hours, you’re kind of forced to follow the news. On whether he foresees a day without a print version: I don’t really. It’s like asking whether you think books will go away because there are books on Kindle? There’s a pace to writing a book. It just isn’t instant; it requires research, commitment, and digging deeper into a subject. And that’s the area in which I like to work, so I think that will persist. Maybe paper will go away, but I don’t think books will go away, and therefore I don’t think magazines and publishing will go away. On what he would hope to say that he had accomplished with the brand one year from now: In your interviews, I was very struck by the guys from Garden & Gun magazine. This isn’t my demographic, but these guys really know what they’re doing. They know what kind of article fits in their magazine and what kind of article doesn’t. And they might have an article about hunting dogs that we would ever run, but for them it’s just right. They know their audience. And they’re regional, but they have the culture of their region in their blood. And that’s the kind of magazine that I’d like to be. I’d like to be favorably compared to those guys, in terms of writing quality and topical interest. If you live in that area; if you’re in my audience and in my community, I’d like you to feel this is your magazine. That’s what I’d like to say in a year. On whether the editorial board and the inspirations that are credited in the magazine are his, Will Hearst’s, or Alta’s: They belong to the Journal of Alta California and we sort of rounded up the input of our staff and even wrote to a few people who told us we didn’t have enough women or people of other ethnicities, so we reedited the Inspiration Board to be a more complete history of our region. And less just people that “Will” liked to read. And we have our Board of Contributors, some of whom are active contributors and some of whom are on standby, because there are special topics where they have expertise. On the 1970s-1980s magazine that tried to be the New York of California called “The New West”: They did a very good job, but I think they were to some degree yoked to this shorter cycle. They were modeled on New York Magazine, which was weekly, then bimonthly. But they had to keep up with events. A new politician comes onto the scene and they had to write about it. And new restaurants open. On being both the editor and the publisher: Well, that’s another compromise. My title was originally going to be “proprietor.” I wanted people to think of the staff as the editorially creative talent, and I was there as a financial investor and as the owner; as the buck-stops-here. But I didn’t want to pretend that I would be doing everything, because you can’t do it all. The business is made out of people; it’s not made out of numbers. On advertising and how he wants it to work in Alta: I wanted to follow the equation the way I think it’s moving, where readers have to be served well enough that you can begin to extract more revenue from them. They’re not going to pay for something that’s no good and they’re not going to overpay relative to competition. But my feeling is that good media will become more paid, and you’ve seen The New York Times and The Wall Street Journal start to charge for their websites. Kindle books are not free because there’s advertising in them. I think there’s a countertrend where readers have to pay a little more and advertisers are willing to pay more. And we wanted to anticipate that. On advertising becoming less important over reader circulation revenue: Advertisers are more fickle than readers. Readers decide what they like and what they’re willing to pay for. Advertisers move in herds. And the herd is moving to online and the herd is moving to Facebook, and there may be good reasons to do that, but I think chasing the herd from the back is not a good business strategy. On anything he’d like to add: Publishing magazines, to use a mathematical analogy; it’s an infinite, dimensional space. It’s not like there’s five niches and you have to pick one. There’s always something else; it’s always around the corner that there’s some originality. I believe in Michael Porter’s theory: Don’t compete to be the best at something that exists, compete to be different. Compete to find something that no one is doing and then do that better than anyone else does. On what he would have tattooed upon his brain that would be there forever and no one could ever forget about him: We always had a great place to work; we always had fun and we were challenged. On what someone would find him doing if they showed up unexpectedly one evening at his home: During the day, it’s probably reading or looking at manuscripts or calling people to see if I can cajole them into working with me. And at the end of the day, it could be a little bit of reading or it could be my kids. And once in a while, I like to solve math problems for fun. On what keeps him up at night: What keeps me up at night is trying to make the experience of reading the magazine a little bit like the experience of living out here in the zone of arts and culture, technology and exploration. I’d like to do a little more environmental writing in the next year. I’d like to connect to that part of our history. 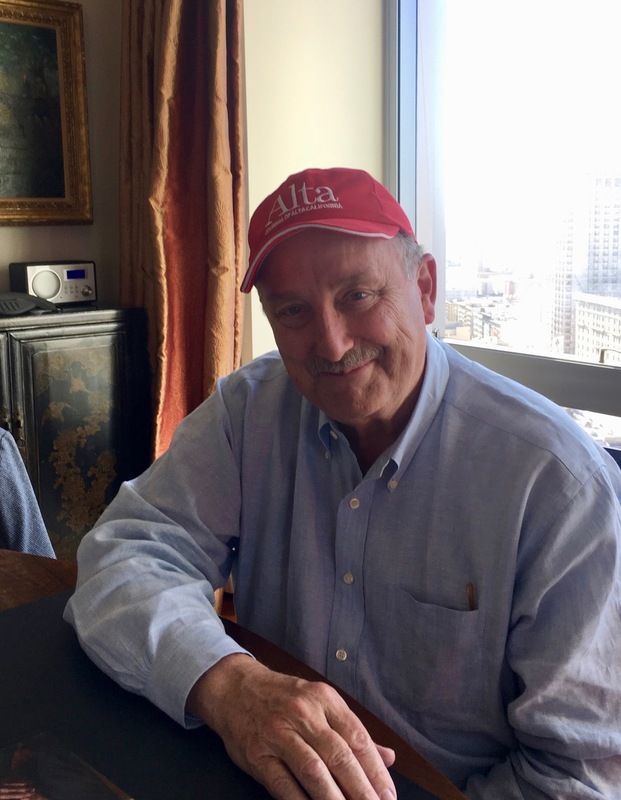 And now the lightly edited transcript of the Mr. Magazine™ interview with William R. Hearst III, editor & publisher, Alta Journal of Alta California. Samir Husni: In your second editorial of the magazine, you write that you’re not a big believer in the old media model, but rather you’re trying to create a new model; a community where subscribers, staff, everybody is curating the information. Can you expand a little bit on your understanding of the new model for Alta, Journal of Alta California? William R. Hearst III: Like a lot of projects, this starts with an idea or sort of a notion. I didn’t wake up as a youngster thinking that I wanted to start a magazine someday. The notion was a certain uncovered coverage area of the West, and its arts and culture. I like to read; I’m a voracious reader and I’m involved with a magazine company and a newspaper company. I’ve been a newspaper publisher, so I’m very comfortable with reading, but I just felt that there was this underserved community that had to do with experiences of people who live in the West. People who sort of see the world like that New Yorker cartoon, but from a different point of view. One where New York and Manhattan seem very faraway and the immediate foreground is the beach and surfing, the mountains and the environment, Hollywood and Silicon Valley; these are our local communities. And I felt that I wanted to do something to talk to those communities. Then the idea of a magazine came second. My notion of the old media model is, and you can exaggerate here; the extreme of the old model is that you’re going to have a genius editor, William Shawn, or maybe you have Helen Gurley Brown, or somebody who is able to answer every question. And then the staff basically runs around executing that plan. At the opposite end of the spectrum, you have a complete, sort of blog community, every opinion is equal; you’re not really talking about facts; you have a comment section of the average website. And I thought there should be something in the middle where you had people who really wanted to work at being editors. Who would cultivate writers; look at pictures and put packages together, but also where some of the people who were writers would become editors, and some of the people who were readers would become writers, and not just in “Letters to the Editor.” So, there would be a much more fluid boundary between who the official staff people were and who the reader people were; who were the contributors and who were the advertisers. I like to feel that our readers aren’t a mailing list, that it’s an actual community. And the community could disagree with us; the culture could change and we would need to change with it. So, I thought of a more dynamic, open model; a little more democratic, but not 100 percent democratic either. Samir Husni: But you take this community one step further; this is probably one of the few times in my 40 years of following the magazine industry that I find an editor challenging readers, telling them that you will pay $10 if they find a mistake in the printed magazine. Will Hearst: I stole the idea from Don Knuth who wrote the print bible of software. He was writing technical articles where mistakes and typos meant that the software didn’t work or what was stated was wrong, but I just felt like we should challenge ourselves. And I worked for a guy when I was younger, the editor of the editorial page of The San Francisco Examiner, and his view was that there should be no typos on the editorial pages. There could be typos in the newspaper because you’re on deadline and you’re in a hurry, but in the things where you were really putting the brand of the owner on the page, there should be no typos. So, I grew up in a culture where typos were, while maybe you couldn’t eliminate them; they were costly. And if you made a typo you had to apologize; you had to correct it and admit your mistake. So, I stole this idea from Don Knuth that we would pay when people told us that we had a fact wrong, a reference that was incorrect, or we had a date wrong. There could be other kinds of mistakes that are more subject to interpretation, but when there are straightforward, factual mistakes or misstatements, or even gross errors of omission, we would make ourselves pay a fine to our readers who had found those things and we would honestly acknowledge them and move on. Will Hearst: (Laughs again) No, we’ve paid out less than $100, but more than $10 since we put the policy in place. Samir Husni: In this digital age, why did you insist on a print component for the Journal of Alta California? Will Hearst: We get asked that question a lot and I think there are two reasons really and one of them is a content reason and one of them is a business reason. The content reason is that I wanted to deal with things that last a little bit longer. I was thinking about the people that I know: writers, photographers, editors; these are people who often write books, that take some time to write something. I was less interested in immediacy; I wanted things that had a lasting quality. I remember when I was a newspaper editor and being surprised that more people go to museums than go to sporting events. More people attend cultural events than attend things that we consider to be pop culture. And so I thought there was a large audience of people who were interested in the arts and culture and technology and ideas, and that audience was really not interested in breaking news. So, the people that I wanted to work with were working on a different schedule. And one reason print attracted me was I wouldn’t be yoked to the daily cycle of doing a website or a blog, because if you’re doing the Huffington Post or you’re doing these sites that have to be updated every 24 hours, you’re kind of forced to follow the news. Something happens and you have to react to it. I wanted to break away from that and print seemed more natural to enforce that discipline on us and we would bore the crap out of people online if we only updated the site once a quarter or once a month, or once a week even was too slow. So, that was kind of the content reason. The things that we wanted to write about and the people that we wanted to work with were not naturally immediacy people, they were people who were more reflective. And the second reason was just economics. If you’re trying to do a daily, you have to have a large staff and you have to have people constantly working on a short deadline. It was just too expensive to do that. So, for the topics that we wanted to cover, something that had a more leisurely pace was better-suited. Now, I do feel, going back to the community idea, that we need to serve people who don’t want print or who want to access articles online or want to access an archive. So we’re trying to find ways to make the online archive and the online edition of the Journal of Alta California be very complete and no additional charge, where part of being a member is you get it all. You become a member and then you get everything. And one of the things that I’m debating is whether we should put more things on the website. For example, we have a person who writes an article; he writes 2,000 words and we can run maybe 1,500. Well, maybe we should let the author go longer online for the people who really want to drill down one more level. So, we’re still trying to figure out what our online strategy is. We know what our print strategy is; we’re print people so we kind of know what to do and what we can afford to do. Another question becomes: what should we do online? It shouldn’t be a scaled-down version of print. It should be an alternative extension of print. And we haven’t quite figured that out yet. I’m not anti-online. The 2018 online newspaper has probably 10 times more readers than the print newspaper, just to give you an example. So, I’m not turning my back on the online edition, I’m just trying to figure out how to make the two work together. But my core goal is more this membership idea; writing about certain topics; covering it well; and then serving that membership with whatever form of content is more convenient for them. And as 10 years goes by and we have 100 readers for print and one million readers for online, then we should probably give up the print and be 100 percent online. Samir Husni: And do you ever foresee that happening in our lifetime? Will Hearst: I don’t really. It’s like asking whether you think books will go away because there are books on Kindle? There’s a pace to writing a book. It just isn’t instant; it requires research, commitment, and digging deeper into a subject. And that’s the area in which I like to work, so I think that will persist. Maybe paper will go away, but I don’t think books will go away, and therefore I don’t think magazines and publishing will go away. I happen to like print; I happen to like the physical, tactile quality. You don’t need batteries; you can fold it up; you can tear it apart. But I tend to be a media consumer; I’m not a vegetarian when it comes to media. I’m kind of an omnivore. I like online; I like print; I like video; I like media. It’s not unheard of for me that when I buy a book, I’ll buy the audio book and then buy the print book, and I’ll buy the Kindle book because I just really like that particular book. (Laughs) And I consume it different chunks at different times. It’s a little more expensive than maybe settling on one habit, but I think media consumption is about information and about human beings. It’s about learning; it’s not about print or online. It’s not about technology; it’s about the content of content. Samir Husni: That’s one thing I strive for in my teaching; to tell the students that I don’t want to teach them the toys of the profession, they keep changing. They need to learn the profession. Will Hearst: It’s very interesting; I give speeches sometimes to newspaper people and I find that if you’re a 60-year-old newspaper person, you’re kind of happy, because you’re going to retire and you can forget all about this technology. And if you’re a very young person interested in journalism, you’re very enthused about your career, because you’re probably going to be a blogger and appear on television, write, shoot your own pictures and maybe edit other people’s work. So, you have this multidimensional talent group in the younger generation. The Hearst Foundation has a journalism award, and these are people who are freshmen in college, sometimes they’re a little bit father along, but they’re typically pre-professional, and they’re enthusiasm is amazing. And their skillset is so much wider than when I was a student. These people aren’t just photographers; they’re writers, photographers, broadcasters, bloggers, reporters, travelers; they’re multidimensional people. If you like media, you better be prepared to be a multitalented athlete. It’s a decathlon; it’s not a single-sport object. Samir Husni: Now that you have two issues under your belt; if we had this conversation a year from now again, what would you hope to tell me that you had accomplished in the year since Issue two was out? Will Hearst: I’d like to do more things outside of just California; I’d like to do the West. I think that’s really the topic zone. If I’m successful, I’d like to have people in Portland, Seattle, and San Diego. Maybe someone in Mexico; maybe some people in Denver who are correspondents and are sending us story ideas, and be where people in those geographies feel that we’re to talking to them. In your interviews, I was very struck by the guys from Garden & Gun magazine. This isn’t my demographic, but these guys really know what they’re doing. They know what kind of article fits in their magazine and what kind of article doesn’t. And they might have an article about hunting dogs that we would ever run, but for them it’s just right. They know their audience. And they’re regional, but they have the culture of their region in their blood. And that’s the kind of magazine that I’d like to be. I’d like to be favorably compared to those guys, in terms of writing quality and topical interest. If you live in that area; if you’re in my audience and in my community, I’d like you to feel this is your magazine. That’s what I’d like to say in a year. Samir Husni: When I look at your editorial board and your inspirations; are these Will Hearst’s inspirations and editorial board or do these belong to Alta Journal of Alta California? 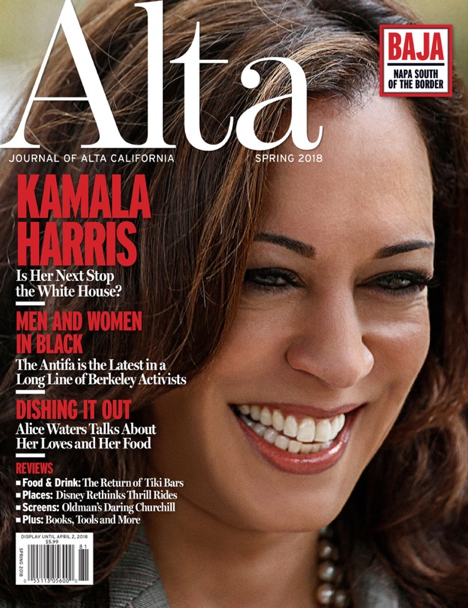 Will Hearst: They belong to the Journal of Alta California and we sort of rounded up the input of our staff and even wrote to a few people who told us we didn’t have enough women or people of other ethnicities, so we reedited the Inspiration Board to be a more complete history of our region. And less just people that “Will” liked to read. And we have our Board of Contributors, some of whom are active contributors and some of whom are on standby, because there are special topics where they have expertise. But I like the idea of honoring the people who came before us, who were already part of the canon of Western literature. And Kevin Starr, who I wrote about in my editorial, was a big believer in the idea that there was a Western canon of writers, viewpoints and experiences. And that this was different than the East and that it was literature-defined; a little bit less academically and more from the life experiences of people who lived out here. So, I wanted to put that Board of Inspiration in to kind of show people that we were respectful of our elders and looking to take the next step, but also to be inspired by what they did before us. Samir Husni: In fact, there was two of them. Will Hearst: They did a very good job, but I think they were to some degree yoked to this shorter cycle. They were modeled on New York Magazine, which was weekly, then bimonthly. But they had to keep up with events. A new politician comes onto the scene and they had to write about it. And new restaurants open. So, we wanted to step back from that kind of pace, which I don’t think works in the 2018 era. I think that’s very expensive to do. I don’t know how The New Yorker people can afford to be a weekly, because you have to have a permanent staff. And you have to have a large staff of writers who are employees, not just contributors. That’s a very expensive proposition. They have a great brand and they’ve been doing it for a long time and they have a very loyal audience, so I don’t think they’re in trouble. I don’t mean to suggest that. But for a startup that would be an impossibly ambitious idea, I think. Will Hearst: Well, that’s another compromise. My title was originally going to be “proprietor.” I wanted people to think of the staff as the editorially creative talent, and I was there as a financial investor and as the owner; as the buck-stops-here. But I didn’t want to pretend that I would be doing everything, because you can’t do it all. The business is made out of people; it’s not made out of numbers. So, you have to get really good people and you have to give them a chance to shine. And to make their own decisions. Our editorial meetings are very, I want to say contentious; people are very candid about offering their opinions and we try and make decisions, and maybe my vote is the last vote, but I’m very interested in making sure that people feel like it’s their magazine, that it’s not the Will Hearst magazine; it’s a community magazine and I’m the proprietor. I’m the caretaker of the community, but I’m not the tsar. I’m not the president. Samir Husni: But as publisher, you have a say even about the ads. One of the things that captivated me when I was flipping through the pages was the type of advertisements that are in the magazine. Will Hearst: My study of publishing in this era is that little by little advertising is less and less important and more and more difficult to obtain. In the ‘70s and ‘80s when I was a younger person, advertising was 80 percent of the revenue. And circulation was something that you had to try and maximize, because you used it to support your advertising rate base. And I think little by little what has happened is that it’s become very expensive to keep giving magazines away, and you become a slave to advertising. And I wanted to follow the equation the way I think it’s moving, where readers have to be served well enough that you can begin to extract more revenue from them. They’re not going to pay for something that’s no good and they’re not going to overpay relative to competition. But my feeling is that good media will become more paid, and you’ve seen The New York Times and The Wall Street Journal start to charge for their websites. Kindle books are not free because there’s advertising in them. I think there’s a countertrend where readers have to pay a little more and advertisers are willing to pay more. And we wanted to anticipate that. I looked at the Whole Earth Catalog and other places where the advertising is really products that would be of interest to the readers as opposed to whomever is willing to pay the freight. So, we give very discounted packages for people who want to advertise with us and we’re very selective about advertising, because we’re not charging them very much and we can afford to be a little bit choosy. We don’t take ads from people whose products we don’t think our readers would be interested in. We look at the advertising as the person who creates that product telling the story of their product. And if we believe that their product is good and their story is honest or amusing, then we induce them to advertise. In the long run, I think we’re going to make it or not make it on whether readers think we’re doing a good job and are willing to pay something. And if you look at the balance sheets of magazines and newspapers, what you’ll see is more revenue is coming from circulation, sometimes online circulation, sometimes print, and less revenue is coming from traditional advertising. Samir Husni: Yes, in fact, one of the last new magazines that Meredith published, The Magnolia Journal, was based on 85 percent revenue from circulation and 15 percent from advertising, which is almost the opposite of the way things were. Will Hearst: But if you go back to the 19th century, when my grandfather was publishing in San Francisco, circulation was 80 percent and advertising was kind of like an extra. It was nice to have; it was an extra. But the real make-or-break was would people put a coin in the box to buy the newspaper? Or typically, buy it in single copy form. And I think, to some degree, we’ve come full circle. Advertisers are more fickle than readers. Readers decide what they like and what they’re willing to pay for. Advertisers move in herds. And the herd is moving to online and the herd is moving to Facebook, and there may be good reasons to do that, but I think chasing the herd from the back is not a good business strategy. Will Hearst: Publishing magazines, to use a mathematical analogy; it’s an infinite, dimensional space. It’s not like there’s five niches and you have to pick one. There’s always something else; it’s always around the corner that there’s some originality. I believe in Michael Porter’s theory: Don’t compete to be the best at something that exists, compete to be different. Compete to find something that no one is doing and then do that better than anyone else does. Will Hearst: We always had a great place to work; we always had fun and we were challenged. Will Hearst: During the day, it’s probably reading or looking at manuscripts or calling people to see if I can cajole them into working with me. And at the end of the day, it could be a little bit of reading or it could be my kids. And once in a while, I like to solve math problems for fun. Will Hearst: What keeps me up at night is trying to make the experience of reading the magazine a little bit like the experience of living out here in the zone of arts and culture, technology and exploration. I’d like to do a little more environmental writing in the next year. I’d like to connect to that part of our history. And the other thing that keeps me up is who are the writers; who are the editors; who are the photographers, and where are the young writers? I think I have a pretty good Rolodex of people my generation who are proven writers, write on deadline, and who are good reporters, but we will have failed if we don’t find two or three young voices that no one has ever heard of. And I hope that we give them their first chance to be in the big-time. I hope that we discover them earlier and we promote them properly. And when they become so famous that we can’t afford them anymore; we will wish them good luck. As long as we have new magazines, hope springs eternal for the magazine media industry. There is no better indicator about the industry than the continued faith in the medium through the launch of new magazines. It is once again time to honor and celebrate those new titles that were born this past year. This time “The Launch of the Year” is being selected from all of the new magazines that were started from October 2016 (the cutoff date for the previous magazine of the year event that was hosted by Mr. Magazine™ and min) through December 2017. Beginning in 2018, we will be following the calendar year, with magazines launched between January 2018 and December 2018. 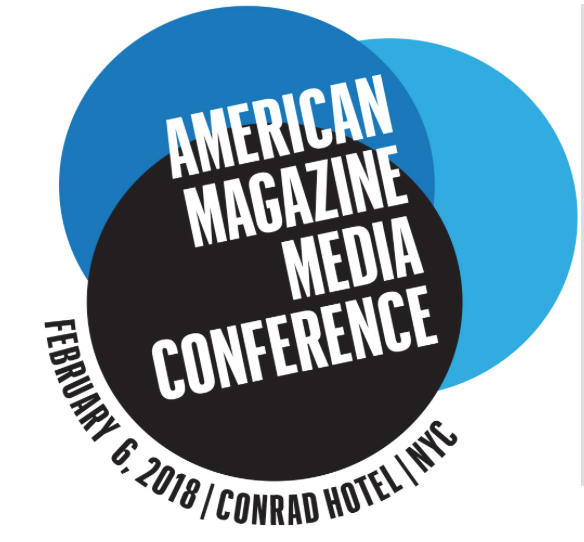 To honor and celebrate those new magazines, Mr. Magazine™ and MPA: The Association of Magazine Media will come together to pay tribute to “The Launch of the Year” during the American Magazine Media Conference in New York City on February 6. By the end of December 2017 a total of 212 new magazine titles arrived on the scene with the intent to publish on a regular frequency, and you can add to that another 600+ bookazines and specials that are not included in this selection. 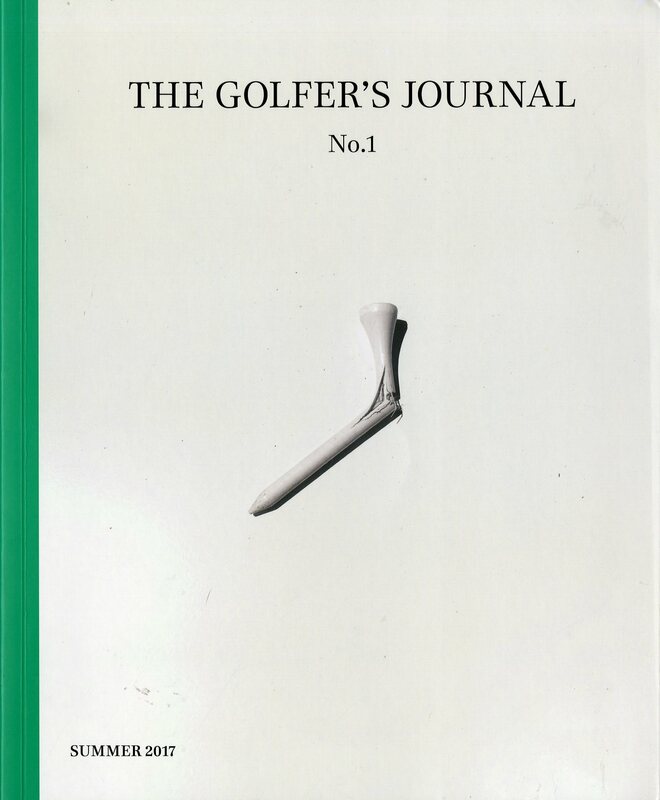 You can view all the new titles at the Mr. Magazine™ Launch Monitor here. • We must have actual physical copies of them. • Major industry leaders’ launching new print magazines certainly is something that must be recognized because it speaks of the power of the medium. These people aren’t in the business of wasting dollars on something that has no value. In the past there have been new offerings from publishing giants such as Hearst, Condé Nast, Meredith and the southern-born Hoffman Media. For companies as distinguished and successful as these to create and bring new titles into this digital world signifies the good health and power of print. • And then there are the entrepreneurs, with their vision and determination to launch their magazine no matter the cost to their wallets and their emotions; they are no less amazing. Some of the best titles we’ve seen in a long time have been from relatively unknown publishers who are not without experience, just without the stolid names that audiences know so well. • The criteria for selection is based on factors that include creativity and audience reaction first and foremost, and then industry trends and as always, those rogue wildcards out there that just won’t be denied and seem to make some of the best magazines around. • Also, something has to grab our attention to be selected as “The Launch of the Year,” based on the comparative analysis. Based on that criteria we were able to bring the nominations down from 212 to 20 titles and now to 10 titles that will compete for “The Launch of the Year.” The winner will be announced during the American Magazine Media Conference that will take place Feb. 6 in New York City. 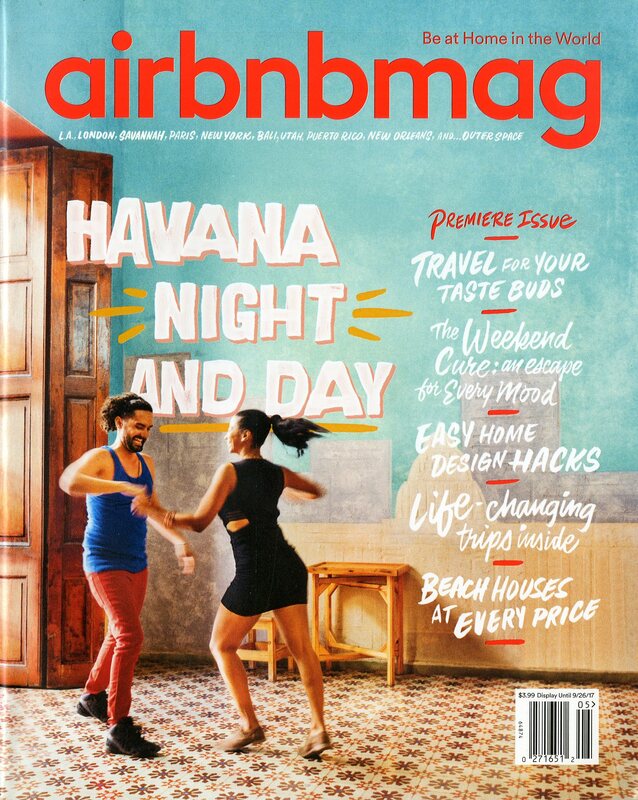 Airbnbmag is an example of a travel-destination website taking a leap into print to further humanize their digital brand. 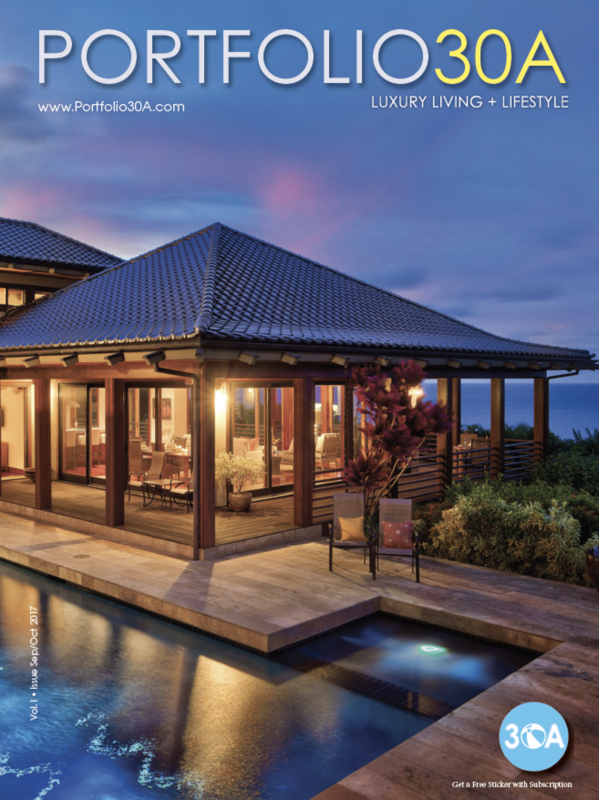 With tantalizing art and content of exotic, domestic and international escapes to complement, this magazine makes taking a vacation more of a unique experience than your budget or schedule might allow. This William Hearst III magazine (and not a Hearst magazine as he likes to remind everyone) details the different facets of life in California for — you guessed it — Californians. Whether it’s the current political discourse, musicians in the Valley, or a yarn spun of Californians past, this magazine will keep you up-to-date in West Coast trials and tribulations. 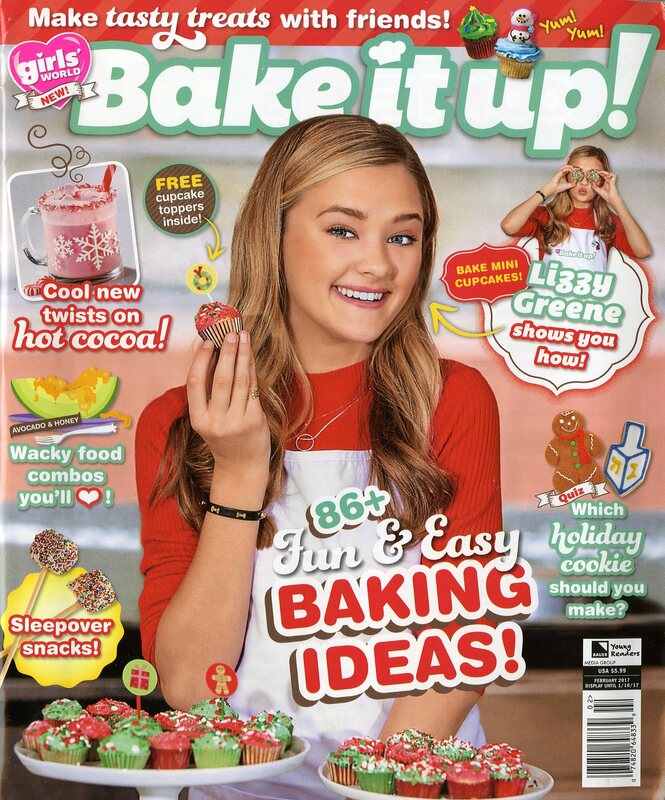 Girls’ World Bake it Up! What little girl doesn’t remember piping dough, mixing flour and topping freshly-baked cookies with sprinkles while listening to Brittney Spears’ “Baby One More Time” in their childhood home? Fast forward 20 years and Girls’ World Bake it Up! is a direct representation of that. This celebrity, food mashup, combines recipes, art projects and other fun activities preteen girls will drop their cell phones for. You may have seen Chris Kimball on late-night TV testing recipes to perfection on America’s Test Kitchen. Since leaving America’s Test Kitchen, he started his own magazine. 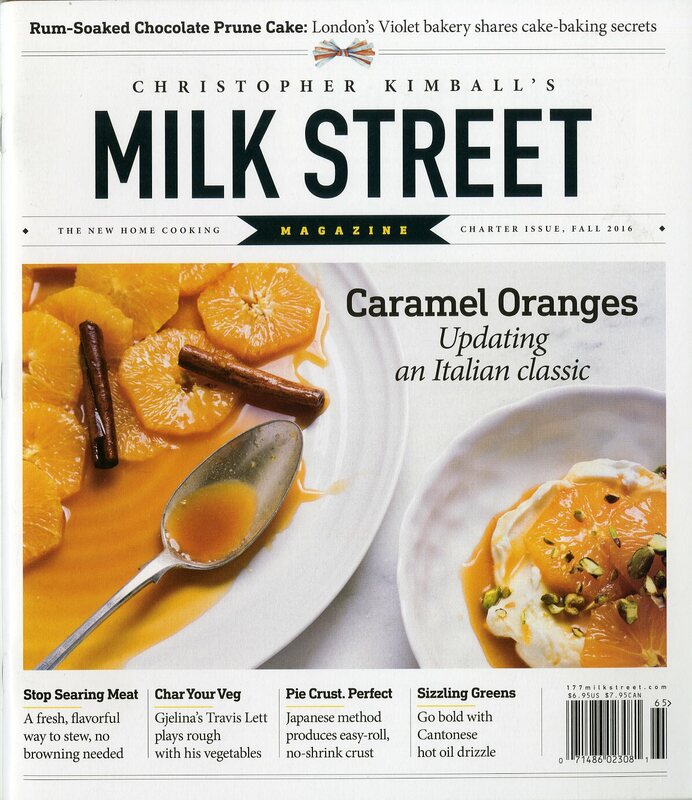 Milk Street is a cultural cooking oddity that presents the reader with a take on food not yet previously explored. It’s the blending of cultures, ingredients, art and content in a perfect concoction of a magazine. Goop is another example of a digital entity discovering print and securing a major partnership between celebrity and publisher. Gwyneth Paltrow serves as editor (and go-to model) for Goop. This chic lifestyle magazine expresses the need for six much-needed distinctions in life: wellness, travel, food, beauty, style and work. There’s more to golf than hitting a small, dimpled ball in, around or near a hole. Golfing is a lifestyle full of luxury and hardships that can only be experienced by those who’ve invested time and money into the sport. Detailed stories, accompanied by beautiful photos teeming with green, will satiate your golfing mind into a clear escape to the fairway. Chip and Joanna Gaines have won the hearts of many television viewers with their shiplap and all-white interior lifestyles, and now they’re winning the hearts of readers, too. Magnolia Journal is yet another example of a brand taking print form and taking the newsstand by storm. You’ll find stunning centerpiece designs, interior makeovers, farm-friendly recipes and even a sighting of the four Gaines’ children in each issue. Airline magazines can be read in-flight, but can this new railroad magazine be read in-rail? Of course it can — and anywhere else for that matter. This anecdotal publication was born from the heart, mind and soul of America’s railways and features content along each and every potential stop. If you have a minute to spare, climb aboard The National for an unforgettable reading and viewing experience. Ree Drummond is a mainstay on morning television screens across the nation. She’s a fan of what most country cooks are, too — real food. 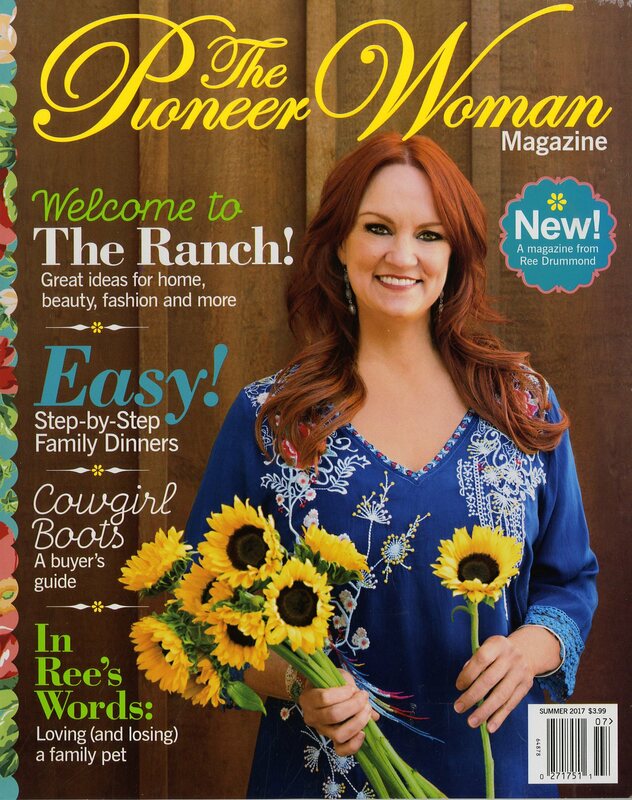 Her brand mantra translates into the new Pioneer Woman magazine. 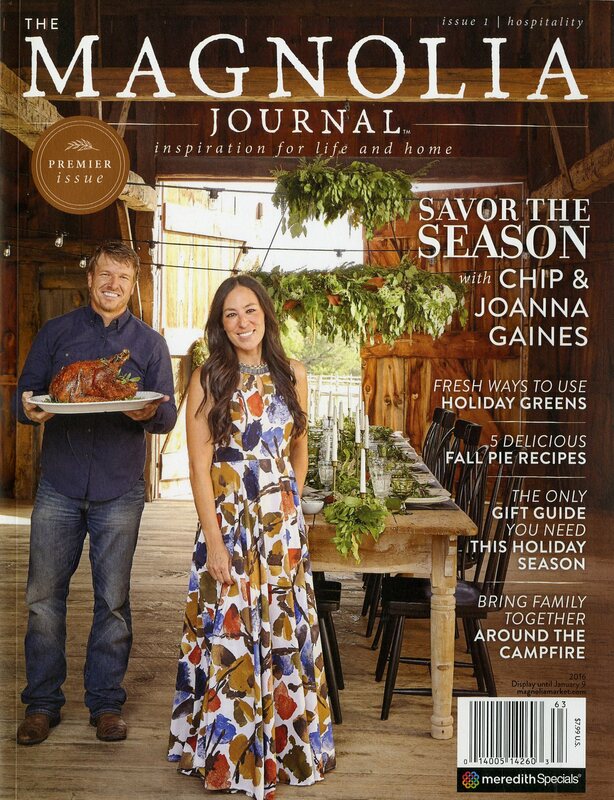 You’ll get more hearty recipes, more Oklahoma prairie views and more of hunky husband, Ladd, in this stunning magazine of life on the ranch. 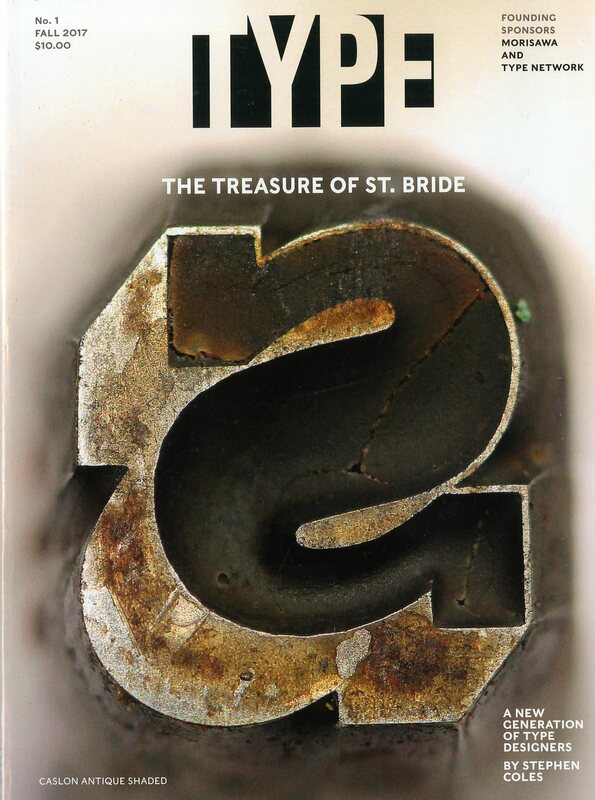 Renowned designer Roger Black is back with a vengeance in his new magazine Type. If you’re not hopping on the typography bandwagon, just know you’ll soon be left behind in a cloud of Comic Sans and Papyrus. The magazine displays stunning representations of typography and allows the reader a pairing of applicable content to complement. Stay tuned for the naming of the top 10 finalist to be announced the third week of January 2018 and looking forward to seeing you at the American Magazine Media Conference in New York City on Feb. 6, 2018. Click here for more information about the AMMC. Weddings are a blessing and oftentimes also a “stressing.” The bride and groom are anxious to have that perfect circle of love moment, all the while trying to deal with also getting that perfect dress, perfect ring, perfect bouquet, and perfect – everything. That’s when they turn to that perfect magazine that can help them do all of that with as less stress as possible. Enter Martha Stewart Weddings. Martha Stewart Weddings was launched as an annual publication in 1994, and was expanded to quarterly in 1999. So longevity is certainly something the magazine knows about, proof positive that its handling the job of stress relief quite nicely. From the beautiful printed pages to its savvy website, Martha Stewart Weddings is carrying the mantra Print Proud Digital Smart to the extreme Mr. Magazine™ likes to see happen. Amy Conway is editor in chief of the magazine and has been with the Martha Stewart brands for many years, holding a bevy of senior roles within the company. 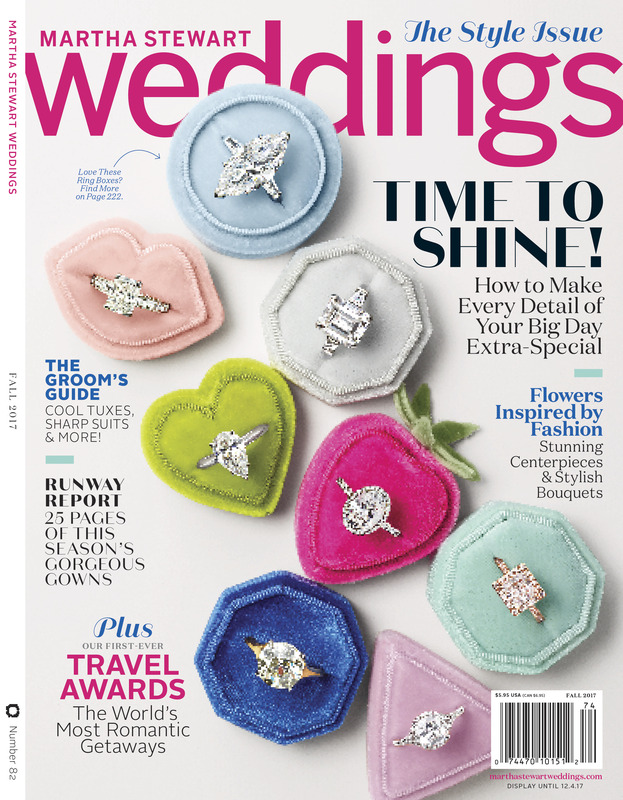 I spoke with Amy recently and we talked about the brand and how she thinks the magazine stands out from all of the other bridal and wedding titles out there on newsstands. With Martha Stewart’s own DIY style that is hers and hers alone, Amy believes that Martha Stewart Weddings reflects that same confidence and sincerity that Martha herself exudes. It’s a personal thing, Amy added. The Magazine helps couples define their personal wedding style, bringing each and every unique celebration to life. Indeed, the magazine is and always has been a contender when it comes to creating the perfect wedding. So, I hope that you enjoy this delightful “walk down the aisle” with Amy and I. And whether it’s your first and only trip or one among many, the Mr. Magazine™ interview with Amy Conway, editor in chief, will certainly put all of your wedding issues in perspective and turn the stressing into a blessing. On why she thinks an ink on paper magazine is still needed for the Martha Stewart Weddings brand: As you know, across all different kinds of areas our industry is definitely changing and we know that our audience gets her ideas, inspiration and information from so many different sources, so we make sure as a brand that we’re giving her information both digitally and in all the ways that she needs it. But, in terms of the magazine, she still definitely needs that as well. And I think one of the main reasons is that weddings can be overwhelming and stressful things to plan, and when you go online and there’s this incredible wealth of information, sometimes that can make it even more overwhelming. When you have a magazine in your hands, as we all know, people who love print; it’s a really personal relationship that you have with your magazine and what can be more personal than planning a wedding? On whether all of that information that’s out there makes her and her team’s job tougher and harder when it comes to curating content: No, I don’t think so, because we basically start from scratch with every issue. We look at what’s happening in the weddings world; we look at what’s inspiring us, and really things begin with the magazine for us. We create something that feels really special and individual. The basic idea of Martha Stewart Weddings hasn’t changed since the very beginning; it’s giving brides and grooms personalized ideas that they can use to make a distinctive day that really reflects them. On the fact that once a reader gets married, the magazine basically loses that member of the audience and how she and her team deal with that: What we need to do is cover these topics with a different spin all of the time, and to come at them in a new way. What we can’t do is get so esoteric; we can’t ever say that we did bouquets two issues ago, so we can’t do bouquets again. We have to cover these core areas again and again, but we just need to do it in a way that always feels fresh, because with the way that trends in weddings change, it’s kind of a natural evolution as well. On what she’s doing to ensure that Martha Stewart Weddings stands out at the newsstand over all the other bridal titles: That’s a great question. Sometimes I think brides just buy every magazine out there. And when they first get engaged, what often happens is they’ll buy all of the bridal magazines and then they will go and take a look and see which one is for them. And the brides who feel that Martha Stewart Weddings is for them are the ones who want beautiful and elegant ideas with a little bit of a hint of DIY. And again, we really provide ideas in a way that no other brand does, which is so important because brides and grooms are looking to make that wedding feel so personal. And that makes us stand out. On how they fare on newsstands since many people do not subscribe to bridal and wedding magazines: We do have more than a handful; we have a lot of industry people who subscribe. And we do sometimes hear from people who just enjoy the magazine and they like to keep getting it because they use the ideas for entertaining and things like that, even once they’ve gotten married. But of course, we’re predominantly a newsstand magazine and I would be lying if I didn’t say that it was challenging. It’s definitely a challenging environment right now for newsstand, for sure. But we’re out there among all of the other magazines and we like to think that we stand out in that crowd. On whether she and publisher, Daren Mazzucca, work together on marketing the magazine: Daren Mazzucca, who you mentioned you spoke with, is the publisher of Martha Stewart Weddings as well, so he and I work together really closely. Actually, he, Elizabeth (Elizabeth Graves, editor in chief MSL) and I talk a lot as well, because there are a certain amount of similarities in the brand and we’re all about Martha in a lot of ways. Darren is really amazing and I work closely with him and also our marketing director in coming up with different ideas and the events that we’re doing. So yes, there’s a lot of collaboration and conversation. On how she makes content into an experience: Our ideas are very actionable. We’re communicating with an audience who is very passionate. You don’t idly look through a bridal magazine, or idly go onto a website; you’re there because you’re looking for ideas and information. So, I think naturally we have a really motivated audience who is actively pursuing ideas. In terms of an experience; digitally, we have a very active following on Instagram. And we communicate with our readers in all different ways. On how she creates Martha Stewart’s wedding instead of Amy Conway’s wedding: That’s a good question. For one thing, it’s not just me or Martha; we have a staff of really creative, amazing people who make the bouquets and who come up with the ideas for the favors; who go out and choose the prettiest dresses. It’s a whole collaboration, and that’s always been the case at Martha Stewart Weddings. On the secret sauce for the longevity of the Martha Stewart titles: I think she started this really before anyone else did and she’s just made this connection with a lot of people, and she has transcended; there is Martha the person and Martha the brand. And she doesn’t appear in the pages of Martha Stewart Weddings for the most part, unless she’s at one of our weddings, but you feel her presence there on every page, because the brand is so consistent and so strong. On the biggest challenge she’s had in her career: In terms of personal career development and growth, I don’t mean to sound Pollyannaish, but I have been really fortunate to have had a long career working largely for one brand or one company and all of its different guises. I’ve probably had 12 or 13 different jobs working for Martha, which is an extremely rare thing in our industry, as you know. So, on a personal basis, I just feel really lucky to have had all of the experience that I’ve had. I don’t really feel like I’ve hit a lot of stumbling blocks along the way. If something can be described as hard, it would be just navigating our way as the media landscape changes. I think that’s hard for all of us editors. But, we’re doing our best to roll with it. On one singular moment since she’s been at Martha Stewart Weddings that was so pleasant it made her think or say wow: I was working on Martha Stewart Living before I came to Martha Stewart Weddings, and Weddings is definitely a different industry. There was one time that I can remember going to my first bridal market, which is the week when you have all of the bridal fashion shows, and getting to go and see those beautiful dresses in person and the amazing designers and the shows that they put on. You know you can say that all wedding dresses are white and elegant and there are definitely a lot of similarities, but when you see them coming down the runway one after the other, you can really appreciate the craftsmanship that goes into them. I have to say that it was a really exciting moment for me, getting to go to my first bridal market, because Martha Stewart Living is not a fashion magazine, and getting into that fashion world was really exciting. On what she would have tattooed upon her brain that would be there forever and no one could ever forget about her: I would have to say that the glass is half full. On what someone would find her doing if they showed up unexpectedly one evening at her home: Most week nights you would probably find me cooking dinner with my boyfriend for my two teenaged kids. And after dinner, you might find me watching, these days, “The Great British Baking Show,” which my kids and I have been binge-watching on Netflix. On what keeps her up at night: It might be my pug; my dog, pugs are very noisy. The things that I think about, if I can’t get back to sleep at night, are often the little things like, did I remember to return that person’s email or something. Those things seem like a bigger deal in the middle of the night, and then in the morning those little worries have gone away. But it’s usually those little things at night that keep me up. In terms of the big picture, the really big stuff in life, I just feel like it has a way of working out. And now the lightly edited transcript of the Mr. Magazine™ interview with Amy Conway, editor in chief, Martha Stewart Weddings. Samir Husni: Bridal and wedding magazines used to be some of the biggest print magazines in the country. I remember days where you needed both hands to carry magazines like Bride or Modern Bride, they were so full. But with digital and social media arriving on the scene, things have changed. Why do you think that you still need an ink on paper Martha Stewart Weddings magazine? Amy Conway: As you know, across all different kinds of areas our industry is definitely changing and we know that our audience gets her ideas, inspiration and information from so many different sources, so we make sure as a brand that we’re giving her information both digitally and in all the ways that she needs it. But, in terms of the magazine, she still definitely needs that as well. And I think one of the main reasons is that weddings can be overwhelming and stressful things to plan, and when you go online and there’s this incredible wealth of information, sometimes that can make it even more overwhelming. When you have a magazine in your hands, as we all know, people who love print; it’s a really personal relationship that you have with your magazine and what can be more personal than planning a wedding? So, when you’re looking at an issue of Martha Stewart Weddings, you’re basically getting curated ideas that are meant for you, with exactly what you’re doing at that moment. You’re getting the newest ideas and the best information all in one place. And that makes it feel current; it feels like that intimate relationship that you have with that magazine. We hear from vendors all of the time that brides still come to the florist and the caterers; they bring in their copy of the magazine with dog-eared pages; they’re ripping out ideas. So, we know that our couples are getting information from so many different sources, but definitely from magazines as well. Samir Husni: Does this make your job easier or harder with the abundance of information out there? Do you feel like your job and your staff’s has changed dramatically and now it’s even tougher and harder on you to curate all of that information? Amy Conway: No, I don’t think so, because we basically start from scratch with every issue. We look at what’s happening in the weddings world; we look at what’s inspiring us, and really things begin with the magazine for us. We create something that feels really special and individual. The basic idea of Martha Stewart Weddings hasn’t changed since the very beginning; it’s giving brides and grooms personalized ideas that they can use to make a distinctive day that really reflects them. So for us, the information chain begins with the magazine, and from there we work with our digital team and our ideas go online and they create a lot of their own ideas as well, and there’s a lot of social media. But I wouldn’t say that it makes our jobs harder per se, because the team who works predominantly on the magazine; we just love what we do and are excited to do it every issue. We have new readers almost every year. And we’re always covering dresses, cakes, flowers, favors and all of those details and etiquette; there’s always a new way to do it. We could repeat ourselves year after year, but we don’t do that, and it’s actually surprisingly easy not to. There’s always another way to make a bouquet; there’s always new dresses coming out in the market. You have to keep in mind everything that’s happening digitally, but in terms of creating the magazine from scratch the way we do every issue, I don’t think that’s harder. Samir Husni: You mentioned that your readers change all of the time. I always use the bridal magazines as an example when I talk about the three types of relationships that can be had with the audience: the one-night stand, where a celebrity dies and you grab a magazine about that celebrity; then there’s the love affair, you get engaged and you go and get all of these wedding magazines, you get married and that’s it, there’s no need for the magazine anymore. And then of course, there’s the long-lasting relationship; you get Better Homes & Gardens for the rest of your life and you get used to receiving it. How do you deal with that changing audience? We know that weddings aren’t going to disappear, but when you meet with your team, do you discuss the fact that once someone gets married, you’ve lost that reader? Amy Conway: What we need to do is cover these topics with a different spin all of the time, and to come at them in a new way. What we can’t do is get so esoteric; we can’t ever say that we did bouquets two issues ago, so we can’t do bouquets again. We have to cover these core areas again and again, but we just need to do it in a way that always feels fresh, because with the way that trends in weddings change, it’s kind of a natural evolution as well. And Martha brands, in general, Martha Stewart Living and Martha Stewart Weddings, tend to be more classic and timeless. So, you can look at one of our issues from 18 -20 years ago and the ideas really hold up and they still show up on people’s online inspiration boards. The ideas are really timeless, but at the same time there are certain trends that we need to reflect on and report on. Certain things stay the same and certain things change, and we have to be right there with the brides and the things that they’re thinking about and looking for. 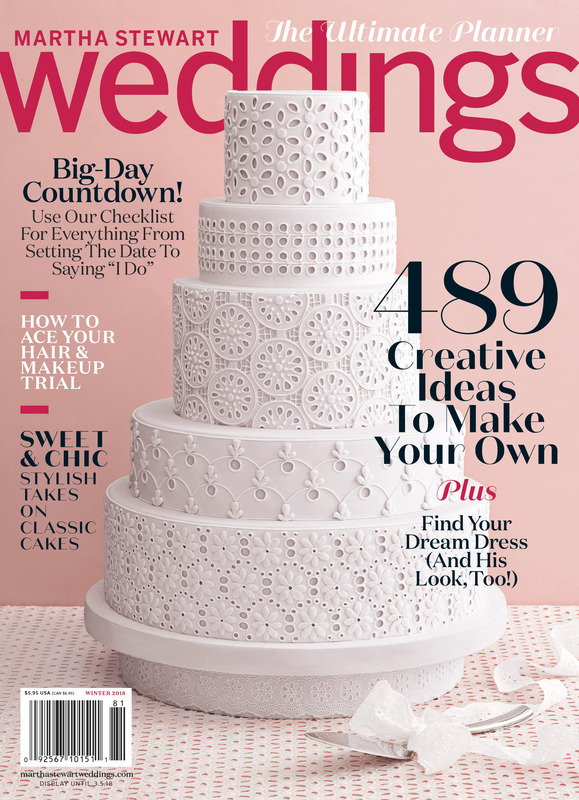 Samir Husni: What are you doing to ensure that when that bride-to-be sees Martha Stewart Weddings on newsstands, it jumps out at her over all of the other bridal titles? Amy Conway: That’s a great question. Sometimes I think brides just buy every magazine out there. And when they first get engaged, what often happens is they’ll buy all of the bridal magazines and then they will go and take a look and see which one is for them. And the brides who feel that Martha Stewart Weddings is for them are the ones who want beautiful and elegant ideas with a little bit of a hint of DIY. And again, we really provide ideas in a way that no other brand does, which is so important because brides and grooms are looking to make that wedding feel so personal. And that makes us stand out. And we actually reflect that on the cover as well. 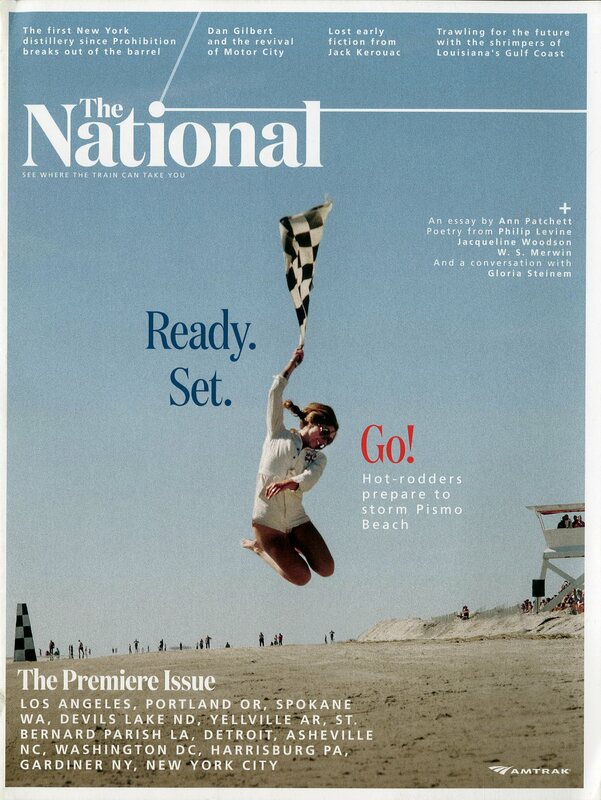 Again, if we’re just trying to stand out on the newsstand, for us we often have an idea on the cover. It might be a cake or a bouquet; sometimes we do have a model in a dress or a real bride or couple on the cover, but we know that some of our bestselling covers are those ideas; the really iconic shops that just make people feel like they want that bouquet or that cake. Samir Husni: With the status of the newsstands and the nature of bridal and wedding magazines; how are you faring on newsstands? People rarely subscribe to bridal magazines. Amy Conway: We do have more than a handful; we have a lot of industry people who subscribe. And we do sometimes hear from people who just enjoy the magazine and they like to keep getting it because they use the ideas for entertaining and things like that, even once they’ve gotten married. But of course, we’re predominantly a newsstand magazine and I would be lying if I didn’t say that it was challenging. It’s definitely a challenging environment right now for newsstand, for sure. But we’re out there among all of the other magazines and we like to think that we stand out in that crowd. Samir Husni: I spoke to Daren Mazzucca not too long go about the mother brand, Martha Stewart Living. As editor in chief of Martha Stewart Weddings, do you spend time with your publisher? Is marketing now also a part of your everyday job? Amy Conway: Daren Mazzucca, who you mentioned you spoke with, is the publisher of Martha Stewart Weddings as well, so he and I work together really closely. Actually, he, Elizabeth (Elizabeth Graves, editor in chief MSL) and I talk a lot as well, because there are a certain amount of similarities in the brand and we’re all about Martha in a lot of ways. Daren is really amazing and I work closely with him and also our marketing director in coming up with different ideas and the events that we’re doing. So yes, there’s a lot of collaboration and conversation. Samir Husni: Today I’m hearing from editors that they’re no longer just content providers, but they’re experience makers. Do you feel that you’re an experience maker with the audience engaging with you, with the magazine, and with the digital platforms? And how do you make the content an experience? Amy Conway: Our ideas are very actionable. We’re communicating with an audience who is very passionate. You don’t idly look through a bridal magazine, or idly go onto a website; you’re there because you’re looking for ideas and information. So, I think naturally we have a really motivated audience who is actively pursuing ideas. In terms of an experience; digitally, we have a very active following on Instagram. And we communicate with our readers in all different ways. Samir Husni: If you were an editor of just a weddings magazine, you would be the creator of the ideas, but how do you channel Martha’s concepts into your own? Do you morph yourself into thinking like Martha? How do you create Martha Stewart’s wedding instead of Amy Conway’s wedding? Amy Conway: That’s a good question. For one thing, it’s not just me or Martha; we have a staff of really creative, amazing people who make the bouquets and who come up with the ideas for the favors; who go out and choose the prettiest dresses. It’s a whole collaboration, and that’s always been the case at Martha Stewart Weddings. I’ve worked for Martha for a very long time and what I have to say is if you’re really someone who understands the brand, which you need to be to work here, and you want to share the basics and what’s important to this brand with other people, then Martha is the guiding force, basically. I wouldn’t say that we’d ask: what would Martha do, but she embodies the brand and she works closely with the people who work for her. So, people really understand what makes an idea a “Martha” idea versus something that’s not on-brand. It’s really following the brand’s ethics and what it stands for. And that’s not a hard thing for the people who work here. Samir Husni: Since you’ve worked with Martha for a long time, what do you think the secret ingredient is for the longevity of her celebrity-based titles, Martha Stewart Living and Martha Stewart Weddings? Amy Conway: Martha came along, doing what she does, before anyone else did. She really struck a chord with people who were looking to get more out of their lives and their home lives. Some people used to say that they would get stressed-out, looking at our magazines because there is so much to do and they couldn’t do it all, and I remember Martha saying, if you just make one recipe or one idea from the issue and it improves your life a little bit, that’s what she wanted. The brand is really about helping people improve their lives. I think she started this really before anyone else did and she’s just made this connection with a lot of people, and she has transcended; there is Martha the person and Martha the brand. And she doesn’t appear in the pages of Martha Stewart Weddings for the most part, unless she’s at one of our weddings, but you feel her presence there on every page, because the brand is so consistent and so strong. Samir Husni: What has been the biggest challenge and how did you overcome it? Amy Conway: In terms of personal career development and growth, I don’t mean to sound Pollyannaish, but I have been really fortunate to have had a long career working largely for one brand or one company and all of its different guises. I’ve probably had 12 or 13 different jobs working for Martha, which is an extremely rare thing in our industry, as you know. So, on a personal basis, I just feel really lucky to have had all of the experience that I’ve had. I don’t really feel like I’ve hit a lot of stumbling blocks along the way. If something can be described as hard, it would be just navigating our way as the media landscape changes. I think that’s hard for all of us editors. But, we’re doing our best to roll with it. Samir Husni: Is there one pleasant moment that you always recall, a day that made you think or say wow? Amy Conway: From my job right now? Amy Conway: I was working on Martha Stewart Living before I came to Martha Stewart Weddings, and Weddings is definitely a different industry. There was one time that I can remember going to my first bridal market, which is the week when you have all of the bridal fashion shows, and getting to go and see those beautiful dresses in person and the amazing designers and the shows that they put on. You know you can say that all wedding dresses are white and elegant and there are definitely a lot of similarities, but when you see them coming down the runway one after the other, you can really appreciate the craftsmanship that goes into them. I have to say that it was a really exciting moment for me, getting to go to my first bridal market, because Martha Stewart Living is not a fashion magazine, and getting into that fashion world was really exciting. Amy Conway: I would have to say that the glass is half full. Amy Conway: Most week nights you would probably find me cooking dinner with my boyfriend for my two teenaged kids. And after dinner, you might find me watching, these days, “The Great British Baking Show,” which my kids and I have been binge-watching on Netflix. Amy Conway: It might be my pug; my dog, pugs are very noisy. The things that I think about, if I can’t get back to sleep at night, are often the little things like, did I remember to return that person’s email or something. Those things seem like a bigger deal in the middle of the night, and then in the morning those little worries have gone away. But it’s usually those little things at night that keep me up. In terms of the big picture, the really big stuff in life, I just feel like it has a way of working out. Linda Thomas Brooks, President And CEO, MPA: The Magazine Media Association And James Hewes, President And CEO, FIPP: The Global Media Network To Keynote The Magazine Innovation Center’s ACT 8 Experience Opening Night April 17. As I’ve said in the past, the idea that digital media was born into this world to destroy print is preposterous. Yes, you heard me, preposterous. The conspiracy theory just doesn’t wash here. The two platforms are mutually conducive to complementary experiences for the one group of people who matter in this quandary: the audience. And to be truthful, the initial introduction of print and digital was rocky, to say the least. It was daunting for digital and frightening for print, since most of the human race was spouting digital’s prowess over legacy media, which was a hard thing for the pixels to undertake singlehandedly and a totally unnerving thought for the print component. And finally, the magazine media industry has started to figure out a way (or ways) to reintroduce the two properly and they’re working on it diligently. So, what does all of the above mean for magazines and magazine media? Where is the industry heading in 2018 and beyond? Both good questions, right? Well, here’s another one: what is the state of magazine media right now in this digital age? To answer those questions (and many others) you’d have to ask people in the know; the ones who have a global perspective on this industry we call magazine media. In order to delve beneath the surface of what appears to be and discover what really is, Mr. Magazine™ asked two people who run a couple of the largest magazine media associations in the world: Linda Thomas Brooks, president and CEO of the MPA – The Association of Magazine Media and James Hewes, president and CEO of FIPP – The Network for Global Media, to take the mic and the stage on April 17, 2018 and give us the lowdown from their perspectives. What resulted is the opening evening of the Magazine Innovation Center’s ACT (Amplify, Clarify, & Testify) 8 Experience, where Print Proud Digital Smart becomes more than just a 21st century mantra. Since 1919, MPA – The Association of Magazine Media has been the primary advocate and voice for the magazine media industry, driving thought leadership and game-changing strategies to promote the industry’s vitality and increase its revenues and market share. MPA represents 200 domestic, associate and international members and is headquartered in New York City, with a government affairs office in Washington, D.C.
And FIPP – The Network for Global Media represents more than 500 content-rich companies or individuals involved in the creation, publishing or sharing of quality content to audiences of interest. FIPP exists to help its members develop better strategies and build better businesses by identifying and communicating emerging trends, sharing knowledge, and improving skills, worldwide. James Hewes to Samir “Mr. Magazine™” Husni: “I fervently believe that this is the most exciting time in history to be working in this industry. From the outside looking in, people may think it’s crazy, why would someone go and work in the publishing industry generally, and I’m not just talking about print, but publishing in media generally. And I say to them, are you crazy? This is an absolutely fantastic time to be working in it, because publishing companies are now exposed to such a broad range, a huge variety, of business areas that in the old days you would never, ever have gotten exposure to, whether that’s e-commerce or social media or social influences, whatever you want to think of, as a new business area that they’ve gone into. And at the same time, we get to play with magazines, which are really fun and really a fantastic industry in their own right. So, all I would say is this is an incredibly great industry and I’m still really excited to be a part of it. 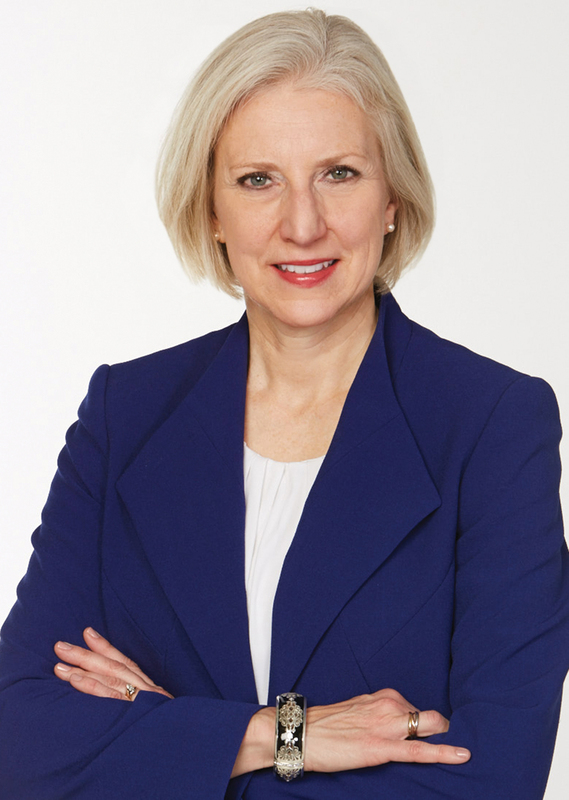 Linda Thomas Brooks has an impressive background in media, having served as executive vice president and managing director of GM MediaWorks, where she built the GM Media Lab, and in leadership roles with innovative companies such as GearDigital and The Martin Agency. 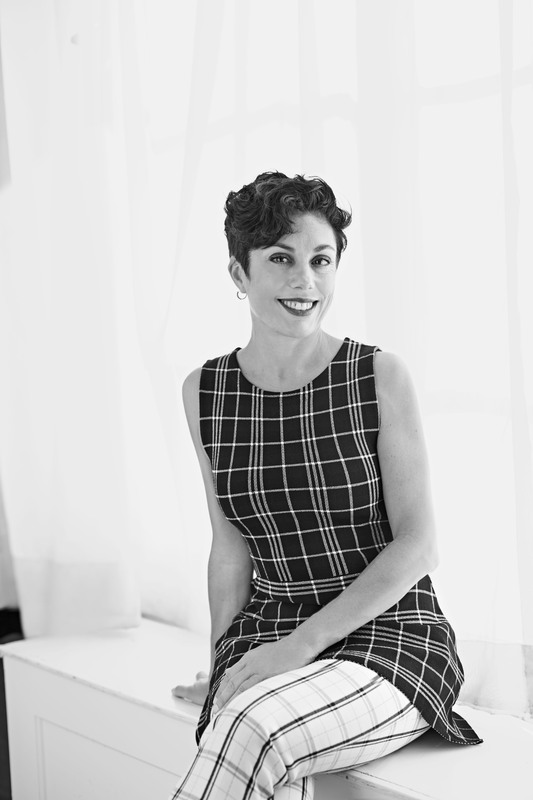 She has spent her career at the intersection of media, consumer behavior and technology. She has developed media and marketing strategies for many well-known brands and companies, including General Motors, GEICO, The American Cancer Society, Johnson & Johnson, Kaiser Permanente and Experian. Her experience serving both businesses and consumers covers a wide-range of media disciplines and capabilities, including digital and emerging media; data and analytics; media strategy, buying and planning. Brooks has also received numerous industry honors, including Advertising Age Women to Watch Award, Advertising Women of New York Impact Award for mentoring and 100 Leading Women in North American Automotive Industry. She was also initiated into the American Advertising Federation Hall of Achievement for early career achievement. James Hewes has been a director of the FIPP Management Board since October 2015 and has been involved with FIPP since 2004 when he was working in the international publishing industry for BBC Worldwide. More recently he has been interim CEO for The Art Newspaper and lead consultant with his own business focused on project management for the media industry. Beginning his career at Barclays Bank as a business consultant, Hewes worked across BBC Worldwide and BBC Magazines from 2001 to 2012 building a track record of success in marketing, digital and print publishing, events and international business development. He was the launch publisher of olive magazine, and grew BBC Magazines’ licensing portfolio from eight to 55 editions including 20 editions of Top Gear Magazine. He was also a key member of the team that sold BBC Magazines to private equity in November 2011 for £120m. He subsequently became publishing director for Top Gear, Good Food, Easy Cook and Lonely Planet Magazine, responsible for the brands across print and mobile applications as well as a director of the BBC Haymarket Exhibitions joint venture. As publishing director of Dubai-based Gulf News Publishing until 2016, he had responsibility for more than 30 product areas, including digital across mobile, websites and apps, live events, magazines, books, newspaper supplements, content marketing and contract publishing. He launched new brands across digital, live events and print including http://www.gntech.ae and Citizen K Arabia and the launch of the group’s first consumer title in Arabic – wheels Arabic. So, if you want to if you want to succeed in today’s world in the magazine business, you have to be Print Proud & Digital Smart. It’s not a choice, it’s an absolute. And if you want to hear and learn more about this highly evocative concept, make plans today to join us in Oxford, Miss. for the ACT 8 Experience, April 17-20, 2018. You won’t be disappointed. 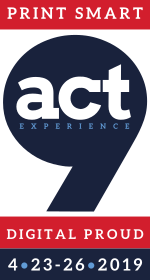 To register for the ACT 8 Experience click here. Space is limited and only the first 100 registrants will be able to attend. Hoffman Media: Finding Print And Digital Avenues To See Continued Success For Both Their Flagship Titles & Their New Titles. 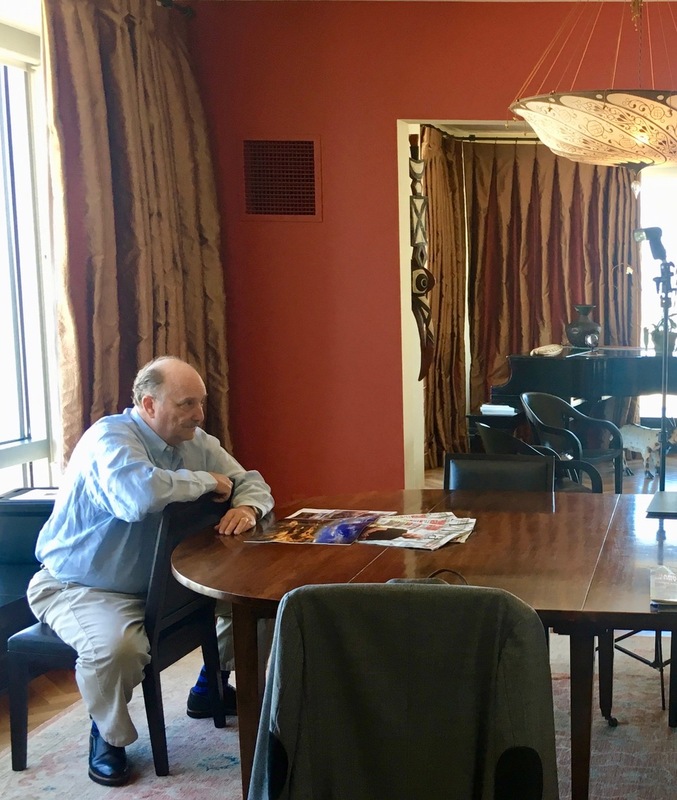 The Mr. Magazine™ Interview With Hoffman Media’s President And Chief Creative Officer Brian Hart Hoffman. 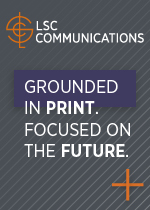 Believing in and promoting top-quality print products is something that Hoffman Media has been doing since its inception in 1983 when Phyllis Hoffman DePiano founded the company as Symbol of Excellence Publishers, Inc. It was renamed Hoffman Media in 1998. Today the company’s flagship brands like Taste of the South and Southern Lady are thriving, and newer titles like Bake From Scratch and Southern Cast Iron are becoming flagships in their own right. 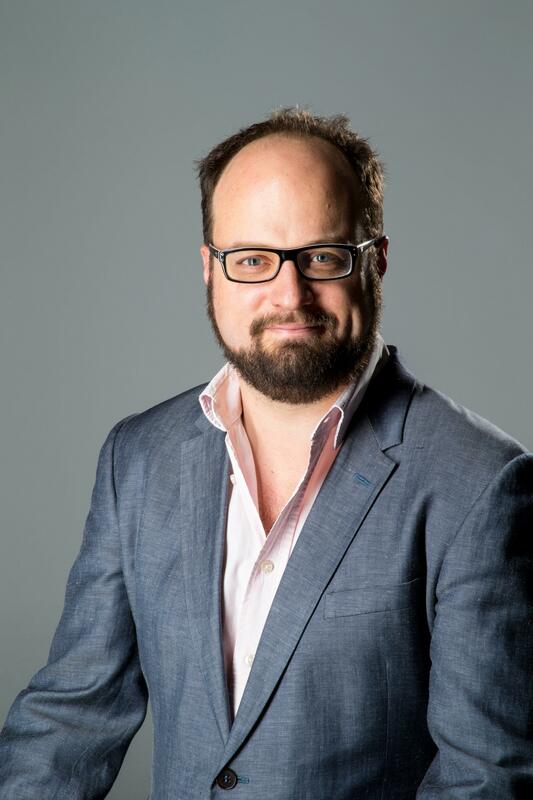 Brian Hart Hoffman is president and chief creative officer for Hoffman Media, and has a passion for the brands and the company that is only exceeded by his energy and vision for the business. With the success of newer titles, such as the ones mentioned above, Bake From Scratch and Southern Cast Iron, and coupled with the readers’ dedication to the look and feel of these titles, Brian and the team at Hoffman saw an opportunity to up the quality of their legacy titles even more by adapting the wider format and giving them a fresh, new look for the fresh, new year. I spoke with Brian recently and we talked about Hoffman Media and its continued efforts to always lead with quality for their readers. Putting their audience first is something that Brian said they will never cease doing. 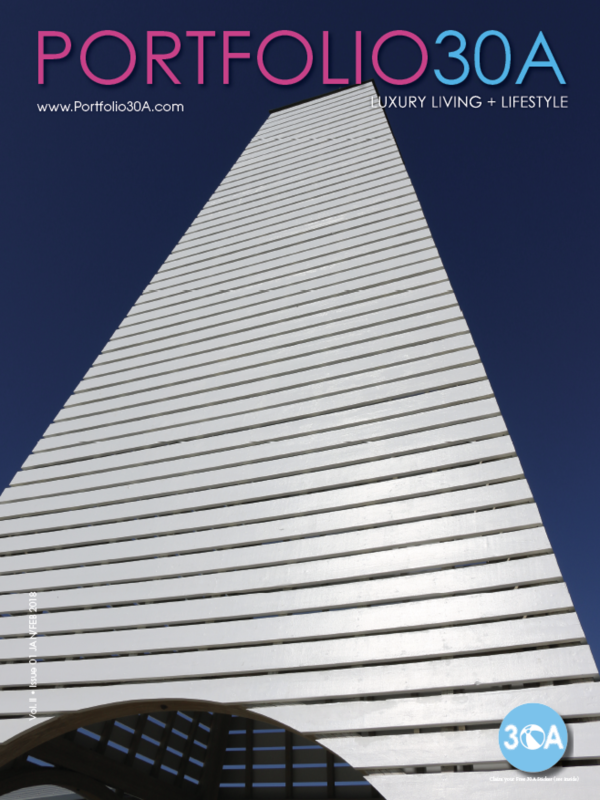 From investing in the paper, the photography, and the content, Hoffman’s hallmark of producing beautifully done and exceptionally well crafted magazines is something that the entire company takes pride in. And with their continued commitment to the digital space, their online users are never disappointed either. 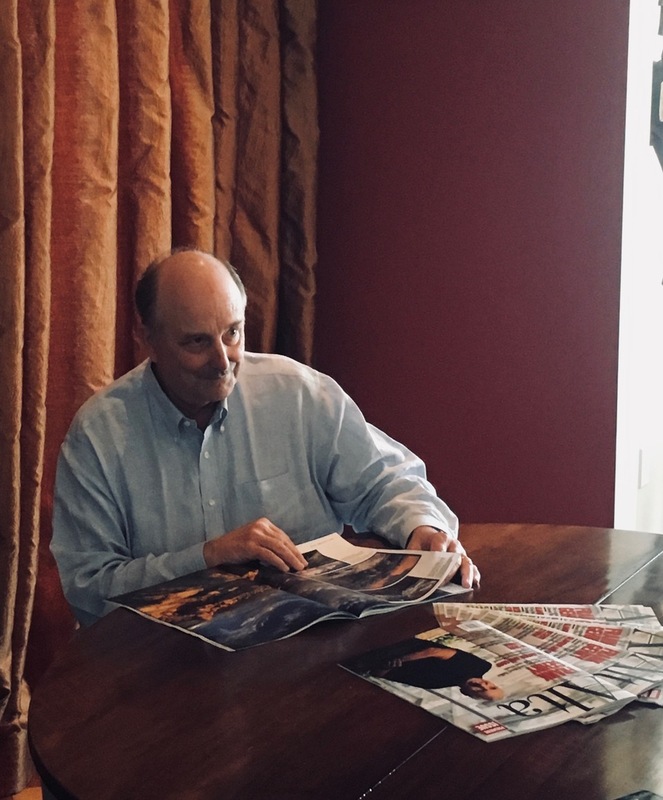 So, I hope that you enjoy this Mr. Magazine™ interview with a man who wants to continue making their print-brand titles better and “brandier” for all their customers – Brian Hart Hoffman, president and chief creative officer, Hoffman Media. On the changes taking place at Hoffman Media: I would say the biggest thing happening that would address all of that, concerning new publications and some of our flagship publications that have been in print for many years; we’re seeing readers really demand the quality and that’s something that Hoffman Media has always taken pride in, publishing top quality magazines. We invest in paper; we invest in photography; and we invest in the content. But with our flagship brands now, we’re having to look back and realize that there’s even more room to upgrade that quality. On whether Hoffman Media will continue to make its print publications printier and brandier in 2018: The Hoffman Media position on that is absolutely; we want to continue making our print-brand publications better and brandier. And updated in line with what people expect and where we see revenue success today. 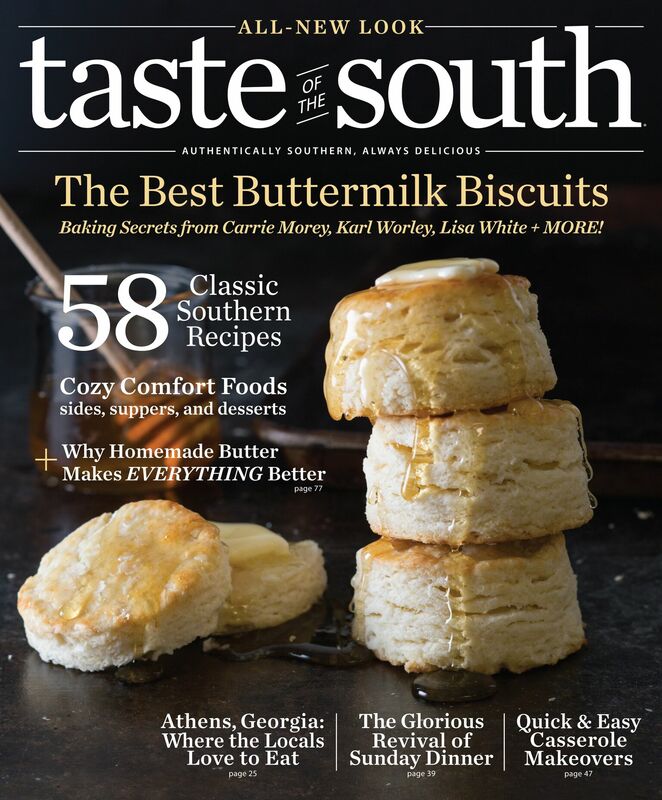 On whether the success of Southern Cast Iron, Bake From Scratch and other more recent titles had something to do with the refresh of established magazines like Taste of the South and Southern Lady: Sure! I would absolutely say that us successfully testing publications that were on wide format and $12.99; they’re more expensive than the cover price of these publications still, and the success we saw from it and the demand from the audience was amazing. On the new title Cook: Real Food Every Day: That publication was something that we saw as what we have called the savory sister to Bake From Scratch, where just an opportunity in the market to present food that’s very flavorful with fresh ingredients and solutions for how to serve them on these busy days where you may be working full-time or taking children to and from various school and sporting events, but you still want to get an amazing dinner on the table. We really just saw a lot of demand in the marketplace for that level of content and so we put out that first test issue. On how he balances being president and chief creative officer of all the Hoffman Media titles and his baby Bake From Scratch: It’s definitely a balance. I have a really great team that I work with here at Hoffman Media. 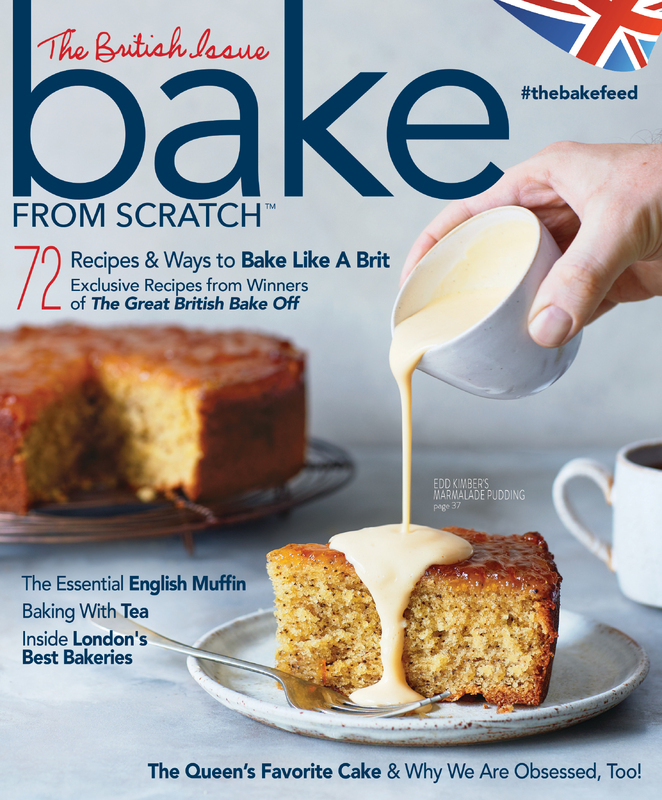 We have a dedicated editorial staff for Bake From Scratch that I have the pleasure of working with, probably daily. I do spend a lot of time overseeing that brand and all of the editorial planning and content meetings. On the biggest challenge he thinks he’ll face as chief creative officer in 2018: I would say the biggest challenge for all of us in the industry, and for us at Hoffman Media, is just finding the avenues to see continued success for our flagship titles and our new titles. We talk a lot about the new face of magazine media and adapting daily to whatever the newest technology is that’s going to come onto the scene that’s viewed as a threat or competition to the print brands. On anything new that might be in the hopper for 2018: The only thing that we’re exploring is the Cook: Real Food Every Day brand and we’re continuing our development and relaunch plans for cooking.com, so those two brands are in the hopper for 2018, you could say. We’ve heard an enormous amount of positive response from the first issue of Cook: Real Food Every Day, and if that same heartbeat is there that I think is, you’ll see more of that this year from our company. And the exciting launch of cooking.com as well. On how Hoffman Media plans to balance cooking.com, a digital brand that doesn’t have a print component, with their other print/digital brands: Our plans aren’t at a state right now where I can tell too much, but I will be in touch with you the minute I am able to, so that you can get the scoop on it as well. But it is a different proposition for the company to be launching a brand that does not necessarily have the print product first or the print counterpart to the digital platform, but I think you will see the same dedication to content creation and the user-engagement experience to have just as much thought put into it as we do for our print brands. On his definition of content in 2018: I would say that content is defined as anything that we produce and include in our print and digital products that provides the reader and user solutions for their lives. And whether it’s travel or food; cooking and baking, the time and energy that we put behind our products, from cover to cover, and everything on our website that we produce, is content. That’s how we look at content. On whether he thinks the industry is reaching a saturation point when it comes to the amount of content that’s out there on topics such as food and travel, or he thinks there’s no such thing: I would say that there’s no such thing because of the different voices and messages by which we deliver the content. Sure, some of our content can be viewed as similar or overlapping in certain subject matters with other publishers or content creators, but I think we all bring a different perspective and voice to those conversations. I don’t know that there’s a saturation point as long as we continue to see engagement from our audiences that’s on the positive side and growing. We are certainly not at the saturation point here at Hoffman Media. On the biggest surprise he had in 2017 when it comes to Hoffman Media: I guess when I look at the sheer volume of work that our employees and content creators here at Hoffman Media are producing. Last year was a record year for us with growth on the newsstand, both in volume and engaged readership. But I had a big wow when I realized that we published over 150 issues of magazines that went into distribution last year. (Laughs) That was my biggest wow. On whether he is where he expected to be after coming back to the business, or he is pleasantly surprised at his role: In September of last year it was 10 years since I joined the business, and when I look back over that decade; I can answer your question in multiple ways. When I started 10 years ago, I never expected what I have experienced now, a passion and love for our industry and the story that’s not yet told, and the growth opportunities that are in front of us. But my passion and fire has just grown more and more every year. So, no, I did not see this coming, but it is a dream job that I am so on fire for every day. On Classic Sewing’s cover price of almost $25 and whether he thinks there is a ceiling on what people are willing to pay for a single copy magazine: I think when they see the value that meets and exceeds that expectation, and it is a subject matter that they are more financially invested in than other areas; obviously, they’re buying and selling materials and various finishes, and with the machines that people are using to sew on; when they pick up a copy of Classic Sewing and realize that the content that’s in that issue and the packaged pattern that’s included in the polybag, the value exceeds $25 each issue. On how his book sales are going now that he’s an author: Yes, it’s going wonderful. 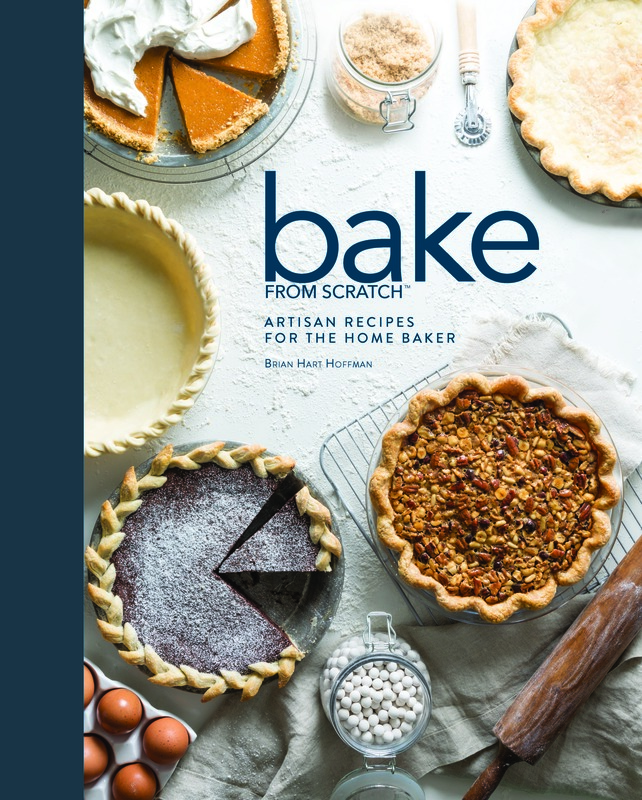 Last year, the Bake From Scratch cookbook was a number one new release and number one bestseller in some of the baking categories on Amazon. We had enormous success and had a second printing midway through the year to get through the holiday time. And the second volume of the Bake From Scratch cookbook is going to be released on March 1, 2018. On what he would have tattooed upon his brain that would be there forever and no one could ever forget about him: The tattoo would say passionate. On what someone would find him doing if they showed up unexpectedly one evening at his home: I love to go home and cook and bake, and spend time in the kitchen with my husband. I unwind by doing more of what we do every day, but I actually get to get my hands in the kitchen and bake. I’m trying to limit the number of items I’m baking in a week, just because the consumption is not as fast as the desire to bake it. It’s truly a passion and a therapy for me all at the same time. I like to unwind by doing more of that with a glass of wine or a cocktail. On what keeps him up at night: The to-do list for this year’s plans for 180 magazine releases. (Laughs) I think doing the best job that we can every day for our employees; for our company; for our brands; and for our readers. I’m always thinking about the next opportunity or ways to make sure that our employees feel appreciated and our magazines stay top-quality, and deadlines, deadlines, deadlines. Those are the things that stay on any magazine editor’s brain, I think. And now the lightly edited transcript of the Mr. Magazine™ interview with Brian Hart Hoffman, president/chief creative officer, Hoffman Media. Samir Husni: Congratulations on all of the changes that are taking place. Brian Hart Hoffman: Thank you. Samir Husni: You’ve implemented the changes with the new magazines that you’ve started and now you’re going back to the established titles and making them bigger, glossier, printier and brandier. What’s going on with Hoffman Media publications these days? Brian Hart Hoffman: I would say the biggest thing happening that would address all of that, concerning new publications and some of our flagship publications that have been in print for many years; we’re seeing readers really demand the quality and that’s something that Hoffman Media has always taken pride in, publishing top quality magazines. We invest in paper; we invest in photography; and we invest in the content. But with our flagship brands now, we’re having to look back and realize that there’s even more room to upgrade that quality. We just see an enormous amount of demand for the wide format publications, and giving them each a new fresh look for the New Year. 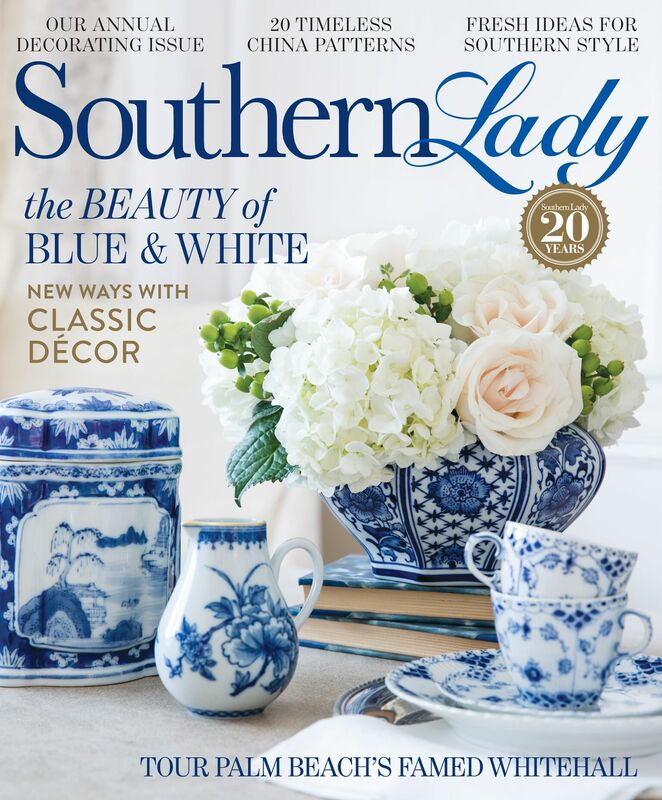 Southern Lady is celebrating 20 years, so it was time for a little refresh, while maintaining the same commitment to the editorial that readers have come to know and love. We aren’t tampering with a lot of the editorial missions, we’re just upgrading the quality proposition. Samir Husni: Is this a glimpse of what we’re going to see from Hoffman Media in 2018; making print printier and the brands brandier? And do you think some people are still hesitant to believe in print the way Hoffman does? Brian Hart Hoffman: The Hoffman Media position on that is absolutely; we want to continue making our print-brand publications better and brandier. And updated in line with what people expect and where we see revenue success today. My industry wish-list would be that we all embrace that same commitment to print and publishing high-quality publications, because I think as an industry that would benefit all of us. But at the same time, I can’t say that I see it happening across the board at other publishing companies, nor would I want to speculate or address why they do or they don’t do that. Our commitment and our business strategy is purely for Hoffman Media. I don’t feel like what we’re doing would be considered a need-to of anyone that we see in our competitive set or in the industry, we just continue to listen to our own customers and what they want. And I think that’s a hallmark of Hoffman Media. We’ve always kept that line of dialogue and feedback open with our audience, and what they want to see more of. Samir Husni:, After you launched Bake From Scratch, Southern Home, and Southern Cast Iron; all of these were launched in the larger format, was that the reason that you felt like Southern Lady and Taste of the South also needed to move in that direction, because of the success of the other titles? Brian Hart Hoffman: Sure! I would absolutely say that us successfully testing publications that were on wide format and $12.99; they’re more expensive than the cover price of these publications still, and the success we saw from it and the demand from the audience was amazing. We did get a lot of questions from readers about whether Taste of the South and Southern Lady were going to have the same upgrades that they saw with the newer products that were coming out of Hoffman Media. And I think that definitely motivated us to look at our flagship brands and the opportunities that would lie in front of us if we transitioned to the wide format and did some refreshing of the branding. So, absolutely, I think our own data drove us to look at the decision on these two titles. Brian Hart Hoffman: (Laughs too). Yes, but other people cook. That publication was something that we saw as what we have called the savory sister to Bake From Scratch, where just an opportunity in the market to present food that’s very flavorful with fresh ingredients and solutions for how to serve them on these busy days where you may be working full-time or taking children to and from various school and sporting events, but you still want to get an amazing dinner on the table. We really just saw a lot of demand in the marketplace for that level of content and so we put out that first test issue. Samir Husni: Every time I chat with you, the magazine that brings the biggest smile to your words is Bake From Scratch. How do you balance between being president and chief creative officer of all the Hoffman Media titles, and your role with your baby, Bake From Scratch? Brian Hart Hoffman: It’s definitely a balance. I have a really great team that I work with here at Hoffman Media. We have a dedicated editorial staff for Bake From Scratch that I have the pleasure of working with, probably daily. I do spend a lot of time overseeing that brand and all of the editorial planning and content meetings. But I have a wonderful team of editors, and tenured employees who are editors and brand directors of our other publications, so we all just have a really great synergy and work relationship where we believe in hard work. And we believe that I can be the editor in chief of Bake From Scratch and lead the creative division of Hoffman Media, because we all wear a lot of hats. I think in previous interviews with you, we have talked about the fact that day-to-day we all wear a lot of hats, and about that being another trademark of Hoffman Media. When my mom started our publishing company 35 years ago, as the editor in chief of one publication, she continued to grow more brands. So, I guess I would say that I’m walking in her footsteps a little bit with that same balance of being editor in chief of one brand, but managing all of our other titles as well. Samir Husni: As you move forward in your role as chief creative officer, what do you think will be your biggest challenge in 2018? Brian Hart Hoffman: I would say the biggest challenge for all of us in the industry, and for us at Hoffman Media, is just finding the avenues to see continued success for our flagship titles and our new titles. We talk a lot about the new face of magazine media and adapting daily to whatever the newest technology is that’s going to come onto the scene that’s viewed as a threat or competition to the print brands. Samir Husni: Is there anything in the hopper for 2018, in terms of new titles? 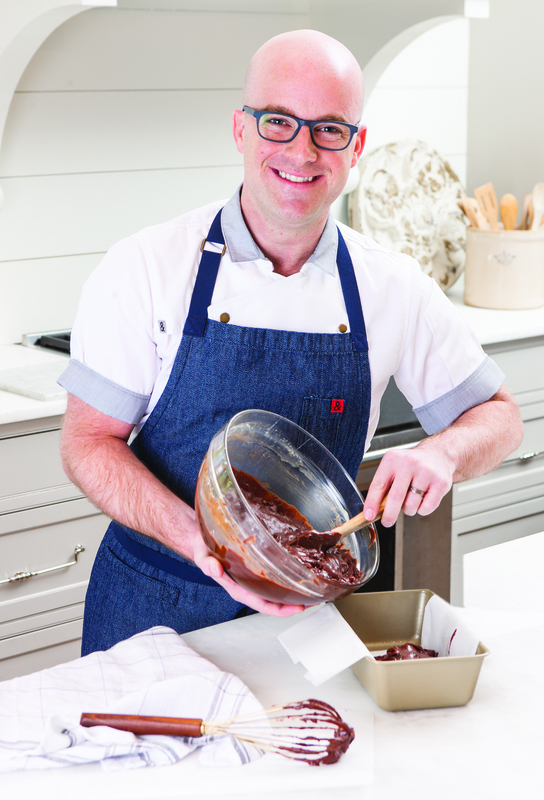 Brian Hart Hoffman: The only thing that we’re exploring is the Cook: Real Food Every Day brand and we’re continuing our development and relaunch plans for cooking.com, so those two brands are in the hopper for 2018, you could say. 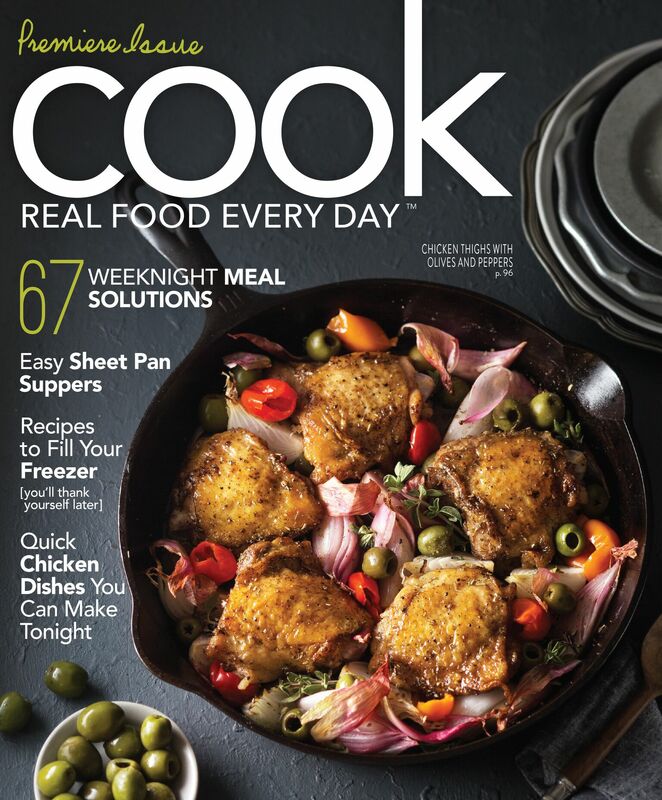 We’ve heard an enormous amount of positive response from the first issue of Cook: Real Food Every Day, and if that same heartbeat is there that I think is, you’ll see more of that this year from our company. And the exciting launch of cooking.com as well. 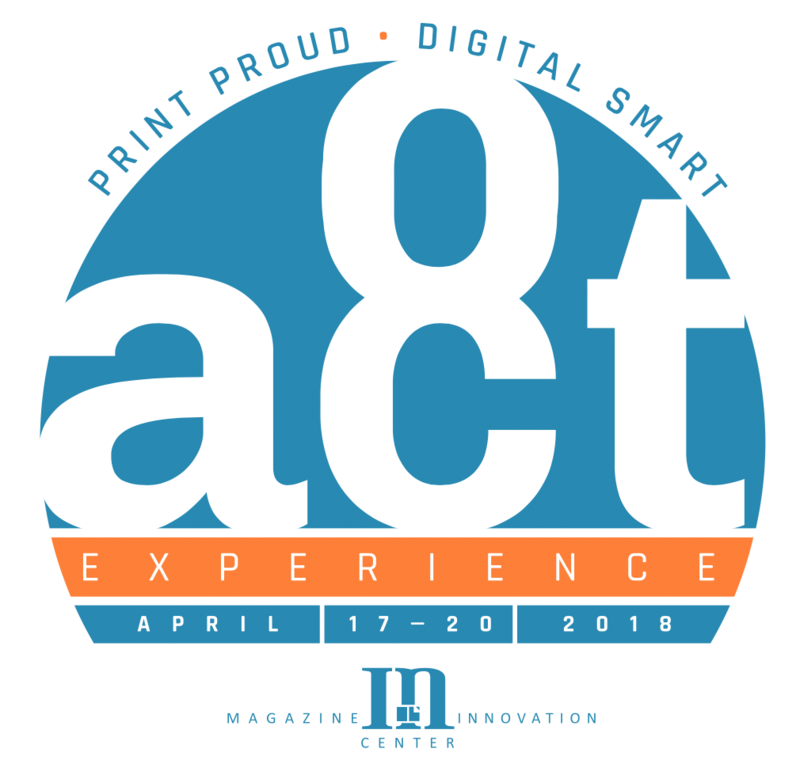 Samir Husni: The theme for this upcoming ACT 8 Experience in April is Print Proud, Digital Smart. And Hoffman Media is a perfect example of being just that; you didn’t throw out the baby with the water. (Laughs) So, what are the plans for cooking.com? How are you going to balance a website, such as cooking.com, that really doesn’t relate to a specific magazine brand, but to the genre of the brands. Brian Hart Hoffman: Our plans aren’t at a state right now where I can tell too much, but I will be in touch with you the minute I am able to, so that you can get the scoop on it as well. But it is a different proposition for the company to be launching a brand that does not necessarily have the print product first or the print counterpart to the digital platform, but I think you will see the same dedication to content creation and the user-engagement experience to have just as much thought put into it as we do for our print brands. You’ll see content that’s not just content, but it’s vetted, quality content and fun. There will be sources where you’ll see success with recipes and the content that lives on the site. Samir Husni: This is a question that I’ve been asking all of the editorial people who I have been interviewing; what’s your definition of content in 2018? Brian Hart Hoffman: I would say that content is defined as anything that we produce and include in our print and digital products that provides the reader and user solutions for their lives. And whether it’s travel or food; cooking and baking, the time and energy that we put behind our products, from cover to cover, and everything on our website that we produce, is content. That’s how we look at content. Samir Husni: When you look at all of the content that you’re producing, and you look at all of the content that’s out there when it comes to food, travel and the Southern lifestyle; do you feel that we’re reaching a saturation point or there’s no such thing? Brian Hart Hoffman: I would say that there’s no such thing because of the different voices and messages by which we deliver the content. Sure, some of our content can be viewed as similar or overlapping in certain subject matters with other publishers or content creators, but I think we all bring a different perspective and voice to those conversations. I don’t know that there’s a saturation point as long as we continue to see engagement from our audiences that’s on the positive side and growing. We are certainly not at the saturation point here at Hoffman Media. Samir Husni: What was the biggest surprise for you in 2017 when it comes to Hoffman Media? Brian Hart Hoffman: I guess when I look at the sheer volume of work that our employees and content creators here at Hoffman Media are producing. Last year was a record year for us with growth on the newsstand, both in volume and engaged readership. But I had a big wow when I realized that we published over 150 issues of magazines that went into distribution last year. (Laughs) That was my biggest wow. Samir Husni: It’s been a few years now since you’ve been back in the publishing business, since you became involved with your mother and twin brother in the Hoffman Media operation. Did you expect to be where you are now when you came back, or were you pleasantly surprised, or you asked what have I done? Brian Hart Hoffman: In September of last year it was 10 years since I joined the business, and when I look back over that decade; I can answer your question in multiple ways. When I started 10 years ago, I never expected what I have experienced now, a passion and love for our industry and the story that’s not yet told, and the growth opportunities that are in front of us. When I started 10 years ago, I was managing our company’s special events and I was traveling some, but I wasn’t involved in the editorial process day-to-day. And I saw areas of that process that I wanted to be more involved in and I got excited, so I jumped in and started doing what I could and learning from the years of experience that my Mom had in the industry, and from the wonderful team of editors that we work with here at Hoffman Media. But my passion and fire has just grown more and more every year. So, no, I did not see this coming, but it is a dream job that I am so on fire for every day. I love seeing our flagship brands continue to be loved by the readership. I love being a part of the new magazine launches, with new ideas that are meeting different voids in the marketplace. And everything in between. Engaging with our readers, and just our industry as a whole; I still see a lot of energy and fire from young creators who believe in the magazine industry. So, that gives me excitement every day. I would say that the energy level grows every day, and 10 years from now I’ll be even more excited. Samir Husni: One of your magazines has a cover price of almost $25 per issue: Classic Sewing. Do you think there’s a ceiling on how much people are willing to pay for a single copy issue of a magazine? Brian Hart Hoffman: I think when they see the value that meets and exceeds that expectation, and it is a subject matter that they are more financially invested in than other areas; obviously, they’re buying and selling materials and various finishes, and with the machines that people are using to sew on; when they pick up a copy of Classic Sewing and realize that the content that’s in that issue and the packaged pattern that’s included in the polybag, the value exceeds $25 each issue. For a publisher to go to that level or really any level of price, the readership has to be able to see and find that value easily. And if they do, we don’t see a resistance to them paying the price. But they’re getting high quality and they’re not getting ripped off, let’s put it that way. Samir Husni: How are your book sales going? In addition to being chief creative officer, you’re also a book author now. Brian Hart Hoffman: Yes, it’s going wonderful. Last year, the Bake From Scratch cookbook was a number one new release and number one bestseller in some of the baking categories on Amazon. We had enormous success and had a second printing midway through the year to get through the holiday time. And the second volume of the Bake From Scratch cookbook is going to be released on March 1, 2018. So, we’re expecting another big year from another book coming out with my name on the cover. Brian Hart Hoffman: The tattoo would say passionate. Brian Hart Hoffman: I love to go home and cook and bake, and spend time in the kitchen with my husband. I unwind by doing more of what we do every day, but I actually get to get my hands in the kitchen and bake. I’m trying to limit the number of items I’m baking in a week, just because the consumption is not as fast as the desire to bake it. It’s truly a passion and a therapy for me all at the same time. I like to unwind by doing more of that with a glass of wine or a cocktail. Brian Hart Hoffman: The to-do list for this year’s plans for 180 magazine releases. (Laughs) I think doing the best job that we can every day for our employees; for our company; for our brands; and for our readers. I’m always thinking about the next opportunity or ways to make sure that our employees feel appreciated and our magazines stay top-quality, and deadlines, deadlines, deadlines. Those are the things that stay on any magazine editor’s brain, I think. With a true entrepreneurial spirit, Sven Bode is a self-made man. He started his own ad agency in his early twenties in Berlin, Germany, when many young people are still trying to find their place in the world. He met and married an American woman and together they came to the United States, Florida to be precise, to live together as husband and wife. Sven settled on an early retirement once they were locked into the Florida lifestyle, but soon found that an existence of ease was not the one meant for him, so he got involved in the ad agency business again, and before long magazines became his true destiny. The rest they say is history. Today, Sven is proud publisher and owner of Orlando Style, Tampa Style, and his latest endeavor, the Portfolio magazine series. 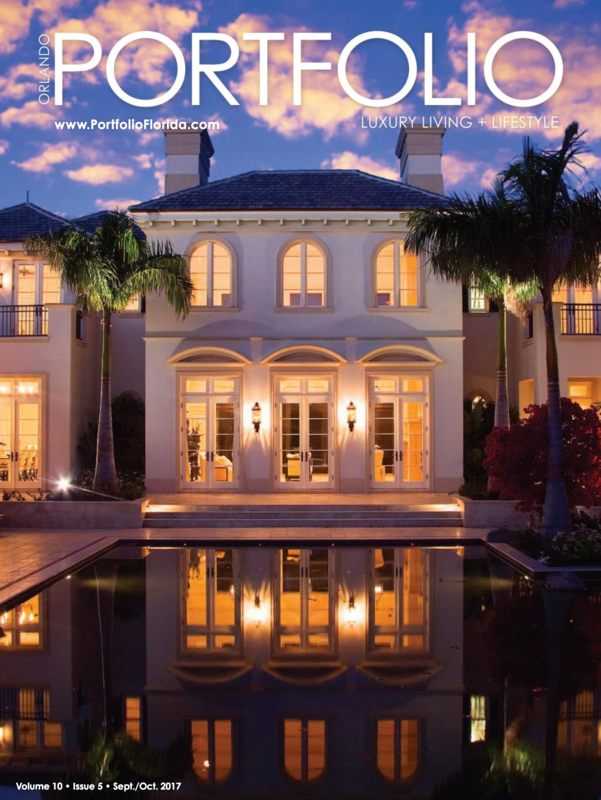 These regional titles have exceeded even his wildest dreams, taking the publications to the top of the area’s luxury market, and making the Crème de la Crème of Florida society anxious to be featured between the magazines’ pages. But along with a who’s who compilation of people, places and things, Sven said the success of his regional titles is that they read more like national magazines, offering travel destinations, celebrity news, and intriguing information. 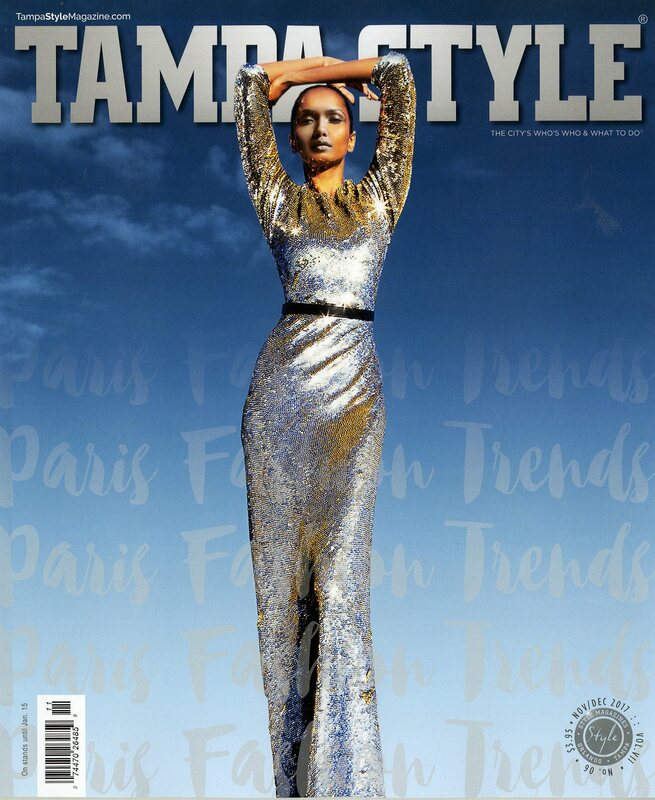 For almost 15 years, Orlando Style and its passionate and sincere owner have been sifting the silky sands of Florida and turning up gold every time when it comes to a successful print magazine. And along with Tampa Style and the Portfolio series, Sven Bode has proven he knows what his audience wants and how to give it to them. 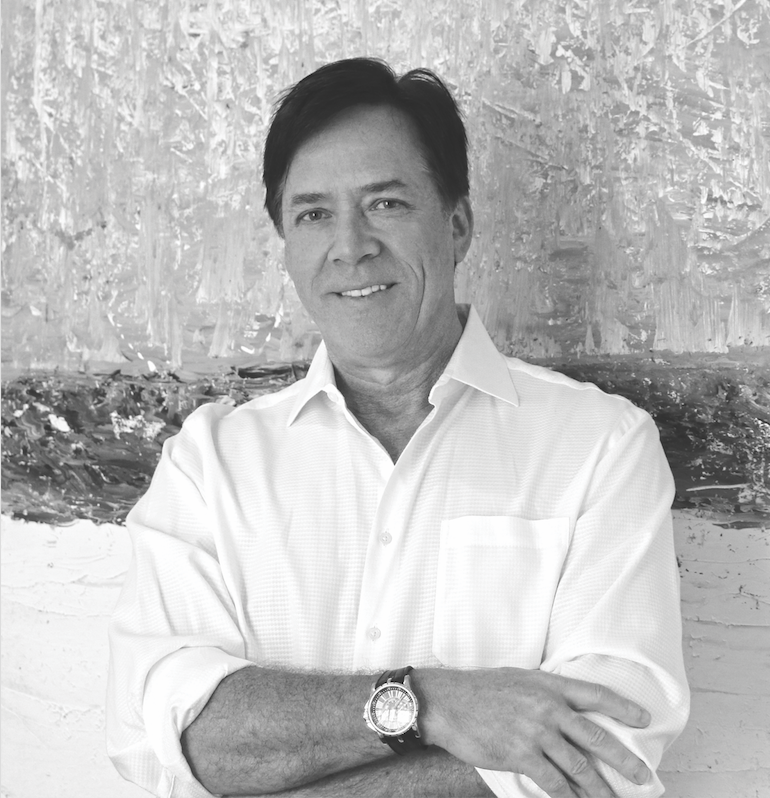 So, I hope that you enjoy this conversation with a true entrepreneur, a man who self-admits his mind is always working and never slows down when it comes to the next great thing – the Mr. Magazine™ interview with Sven Bode, founder, owner & publisher, Orlando Style, Tampa Style and Portfolio Magazines. On his story, how he began in the magazine media business: Yes, Orlando Style was the first title here in America. I’m originally from Berlin, Germany, West Berlin at that time, and I studied engineering, so it’s completely different, but maybe not that far away if you think about it, (Laughs) because I focused on industrial design. In my early twenties, I started my first company, and then a few years later, at 22 or 23, I started an ad agency. Then I became involved with an American girl. (Laughs) And she wanted to come to Florida, actually, she wanted to come back to America, and so we chose Florida. But then I started with an early retirement, which didn’t work, on Marco Island; beautiful Marco Island. Like an entrepreneur, my blood was boiling and I couldn’t go boating every day, that was too boring for me. (Laughs) And then we came to Orlando and I said to my wife, there are only these old, classic kind of city magazines, like what you have almost all over the country. Very dry; I would say, even boring. On the secret of longevity with his regional titles: It’s constantly bringing something to the people that surprises them, especially with Orlando Style. We’re literally working with hundreds of photographers, worldwide even, like a national magazine. I’m always comparing myself to a national magazine, and I’m from Berlin, not from a small city, and my wife is from Los Angeles, so we know the world. We’ve traveled the world and we kind of live that life that our readers live. And that’s a big advantage, because we know, I think we know and I believe we proved we know, what these readers want. On how he continues to survive in print in today’s marketplace: That’s definitely a difficult part. But my belief is that the Internet is more a mass market kind of tool where you can locate things, like a Wal-Mart or something, or some kind of other information; blogs that talk about teenage riots or things like that. That’s not what we do. We focus really on the luxury market, and this market has actually had a very good year, better than before the Recession actually, as far as I know. We survived the Recession years with a dropdown of maybe 25 percent or so, but I’m not a big, large corporation; I have to make a profit. I cannot go in red numbers for several years. (Laughs) That’s not good. I may survive that, but the company wouldn’t survive it. On what has been the biggest challenge for him: The biggest challenge with regionals is that we can’t go ahead and say, okay, I’m hiring a sales team of 10 people and I pay them a $100,000 per year; that’s just not possible. Sales people are the business challenge; it’s a constant fluctuation, they come and they go. But luckily, with us, we have some very consistent ones and they’re really good, and they make good money. But it’s a tough thing. On what he would like to accomplish in 2018: We do want to implement more of the digital part, which we have over 100,000 people who are actually recorded members; you could even call them subscribers, constantly getting our information. 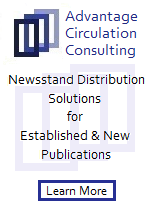 We have e-blast tool and then also all of the websites. We’re also working on the serve part, more in that direction, so that we attract people easily. They can buy an ad with us, either one-by-one or do a frequency. We implement that more and more now. And it’s actually starting to pick up. That makes it easier for print to get more pages sold. On whether they are becoming platform agnostic: Yes, the platform is expanding too; it’s not just face-to-face, phone, or email. It’s everything. Also activating people, they’re actually on the phone or on the web to say, click and their credit card here; it’s an easy process. They can buy with one click. It’s an easier process and people like that. They’re having some benefits out of it; the benefit of using their credit card and maybe earning points and things like that. All of these things are working together and it seems to be working as far as we can see already. We have some traction on that part. On whether he and his wife are permanent Florida residents now or there are plans to go back to Germany: No, I don’t go back to Germany. I spend part of my time at the beach in the Panhandle, and going to Orlando. I go often to Orlando, but we work using normal technology. It makes it much easier to work streamline on new things. My personal clients that I have are mostly in New York or Atlanta, but we mostly use email or phone. But we’re in Florida. On what someone would find him doing if they showed up unexpectedly one evening at his home: As a typical entrepreneur, I’m a 24/7 type of person. (Laughs) You never stop thinking of it, so I’m often doing some real estate things and I’m an accomplished artist also; a painter. I paint and even sell them for a good price. So, that relaxes me and cooking also relaxes me, and I have twins – two-and-a-half-years-old, so that’s what I do with the rest of the day. (Laughs) It’s good. I’m very lucky and happy. On what he would have tattooed upon his brain that would be there forever and no one could ever forget about him: Just that I’m a good person. I don’t like to cheat anybody or harm anybody. And I also want to be successful. I always try to see the good in people and act like it. On what keeps him up at night: (Laughs) That’s a hard one. With any business there’s always something. I have to be the person that’s putting out fires that may occur, and that’s with any company. Nobody can tell me it never happens to them. If someone makes a mistake, I have to be the one who soothes the ache, you know? (Laughs again) That keeps me up at night sometimes. 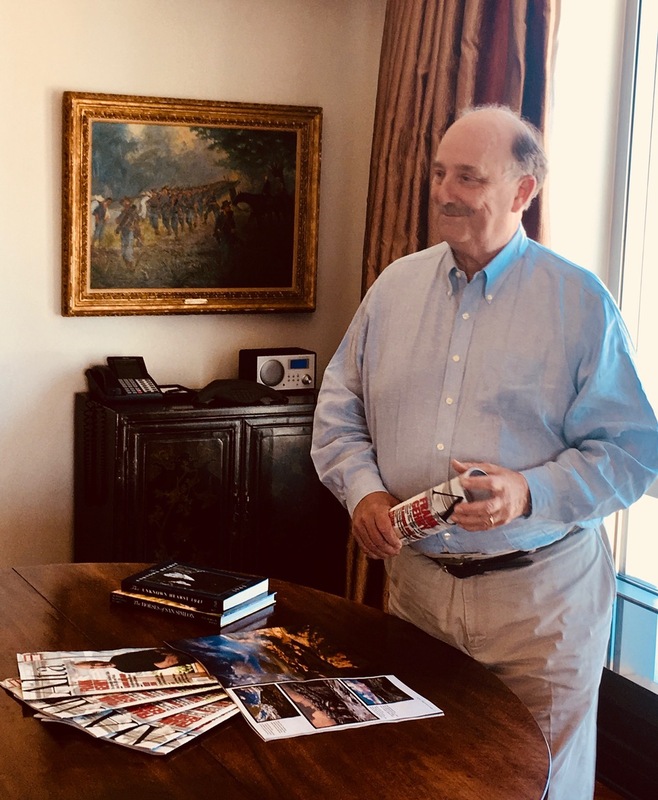 And now the lightly edited transcript of the Mr. Magazine™ interview with Sven Bode, founder, owner & publisher, Orlando Style, Tampa Style, Portfolio Magazines. Samir Husni: Tell me your story; how did you end up doing what you’re doing? I believe Orlando Style was the first title? Sven Bode: Yes, Orlando Style was the first title here in America. I’m originally from Berlin, Germany, West Berlin at that time, and I studied engineering, so it’s completely different, but maybe not that far away if you think about it, (Laughs) because I focused on industrial design. In my early twenties, I started my first company, and then a few years later, at 22 or 23, I started an ad agency. Of course, there were advertising agencies in Berlin, which were kind of following the road to top 50 in mag, 60 years. That was also when the Wall opened up at that time, and I was bought out by an American advertising company. I wanted to go into the Eastern market. It was very good and efficient and hard work, but it was the right thing to do, I guess. So, I started another little ad agency, just to do something. I only had about 10 clients or so within a few months. Not too much work, but just something to do. But then I got an offer to buy into a publication, like a food guide type of magazine. And it was an annual, very difficult, obviously. Annuals are terrible, with the logistics and everything. I expanded it to other markets, and then I expanded it a little bit more to Miami and Key West. And then I sold it a couple of years later because it was just too much of a pain, but I sold it at a profit. And then we came to Orlando and I said to my wife, there are only these old, classic kind of city magazines, like what you have almost all over the country. Very dry; I would say, even boring. Not really focusing on what the people want, more like focusing on what they used to do for the last 60 years or something. And that’s really very unattractive. And Orlando was kind of in a phase of getting totally modernized, it was 2003 – 2004. So, I thought, okay, nobody is really focusing on that and that’s what people who are really wealthy here want. There are quite a few billionaires in Orlando. So, I said let’s start a high-class magazine like an Ocean Drive Magazine, but called Orlando Style. And that’s the story. I financed it all myself; I didn’t take out a loan, I had enough money. And the first issue was really like an overnight success. I had people from Universal and other bigger companies in the city coming to me at an event where we had actually delivered magazines; and people were coming up to me and saying they just had to be a part of this. And I said okay, (Laughs) very good. But for the first issue, I had some good contacts; I hired in the beginning Lizzie Grubman as PR for the company; she’s from New York City. And she brought me into some agencies; it was really good. And for the first issue I actually had really good national advertisers already and that’s very unusual for a regional, especially for an Orlando regional. That worked out very good and then I had a great team preselling everything. So, we did alright for the first issue. And then we want on from there. First it was a bimonthly and in 2007 I changed over to 10 times a year, which is unique for an Orlando. You can’t really do 12, even though others do 12, it really doesn’t make sense financially. Samir Husni: What’s your secret? I mean, others start magazines and fold. 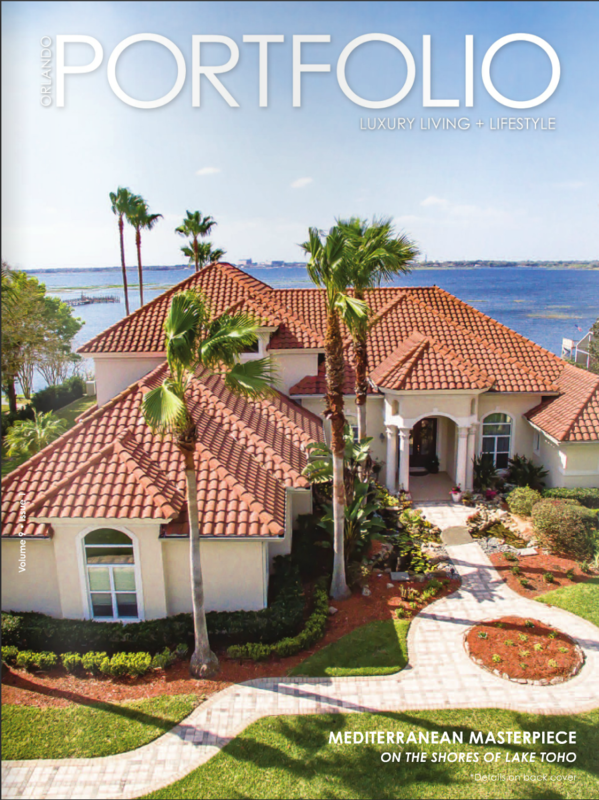 We’ve seen a lot of magazines come and go; maybe they’ll survive a year or two, but you’ve been almost 15 years with Orlando Style; another seven or eight years with Tampa Style, and now with Orlando Portfolio. What’s your secret? Sven Bode: It’s constantly bringing something to the people that surprises them, especially with Orlando Style. We’re literally working with hundreds of photographers, worldwide even, like a national magazine. I’m always comparing myself to a national magazine, and I’m from Berlin, not from a small city, and my wife is from Los Angeles, so we know the world. We’ve traveled the world and we kind of live that life that our readers live. And that’s a big advantage, because we know, I think we know and I believe we proved we know, what these readers want. It’s pretty much like a vogue magazine in a regional area, they don’t really need the vogue anymore, because they have it here with them and more personalized, like what really affects them. But also with information about the rest of the world; we have celebrity news, high-end cars, travel destinations around the world. We’ve built it like a national magazine for a regional market, which is very unusual. I don’t focus only on what’s the mayor doing, and putting the mayor on the cover. I’ve never sold my cover ever, and I’ve had really high offers from some local bigshots, but I’ve always declined. You have to stick to your concept, or otherwise you’ll fail. It’s like the McDonald’s principle: your consistency all over; people know what to expect, they see something as exciting and they want to see more of it. Keep that excitement up, that’s a big part of it. Samir Husni: You started the magazine before the dawn of the digital age in force, and then 2007-2008 happened and we had the economy crash and technology burst onto the scene. We had Smartphones, Smart tablets, and now digital is everywhere. How do you continue to survive in print in today’s marketplace? Sven Bode: That’s definitely a difficult part. But my belief is that the Internet is more a mass market kind of tool where you can locate things, like a Wal-Mart or something, or some kind of other information; blogs that talk about teenage riots or things like that. That’s not what we do. We focus really on the luxury market, and this market has actually had a very good year, better than before the Recession actually, as far as I know. We survived the Recession years with a dropdown of maybe 25 percent or so, but I’m not a big, large corporation; I have to make a profit. I cannot go in red numbers for several years. (Laughs) That’s not good. I may survive that, but the company wouldn’t survive it. So, we do negotiations where we buy stuff, such as printers. That’s a big part of it. The price is going up again on printing, but at that time, we had a lot of power to say, okay, you want to print a lot of our magazines here, give me a good price. Also my advertisers, they have only so much money and they want to get in the magazine for that. So, you have to carry on to the next one, else you cannot survive. Samir Husni: And during that “sailing,” what has been the biggest challenge that you’ve faced and how did you overcome it? Sven Bode: The biggest challenge with regionals is that we can’t go ahead and say, okay, I’m hiring a sales team of 10 people and I pay them a $100,000 per year; that’s just not possible. Sales people are the business challenge; it’s a constant fluctuation, they come and they go. But luckily, with us, we have some very consistent ones and they’re really good, and they make good money. But it’s a tough thing. Samir Husni: As you look toward the future, into 2018 and beyond, what’s your roadmap? What do you want to see a year from now? If you and I are chatting then, what would you like to tell me that you have accomplished in 2018? Sven Bode: We do want to implement more of the digital part, which we have over 100,000 people who are actually recorded members; you could even call them subscribers, constantly getting our information. We have e-blast tool and then also all of the websites. We’re also working on the serve part, more in that direction, so that we attract people easily. They can buy an ad with us, either one-by-one or do a frequency. We implement that more and more now. And it’s actually starting to pick up. That makes it easier for print to get more pages sold. Samir Husni: So, you are integrating print and digital? You’re becoming platform agnostic? Sven Bode: Yes, the platform is expanding too; it’s not just face-to-face, phone, or email. It’s everything. Also activating people, they’re actually on the phone or on the web to say, click and their credit card here; it’s an easy process. They can buy with one click. It’s an easier process and people like that. They’re having some benefits out of it; the benefit of using their credit card and maybe earning points and things like that. All of these things are working together and it seems to be working as far as we can see already. We have some traction on that part. The magazines need all of that complete attention and it’s always a new issue; a new work. It’s always constantly going after it to see what is the newest thing and what can we present to these people and how to make it more attractive. Samir Husni: Are you now permanently residing in Orlando, or are there plans to go back to Germany? Sven Bode: No, I don’t go back to Germany. I spend part of my time at the beach in the Panhandle, and going to Orlando. I go often to Orlando, but we work using normal technology. It makes it much easier to work streamline on new things. My personal clients that I have are mostly in New York or Atlanta, but we mostly use email or phone. But we’re in Florida. And with the expanding of the Portfolio part; I’m trying to see if we can maybe bring that into a franchise area, to give other people the opportunity to do something like this. Others have been successful with it. With the Style magazines, I’m not much on expanding more than it is, but you never know. So far, it’s running smooth, like a well-oiled machine. (Laughs) And I like that. It gives people jobs and it’s running fine. We have good advertisers; they’re continuously resigning and that’s a very important part. It’s a big compliment also and we feel we’re doing the right thing for them. They’re getting the right feedback, so that’s also important. Sven Bode: As a typical entrepreneur, I’m a 24/7 type of person. (Laughs) You never stop thinking of it, so I’m often doing some real estate things and I’m an accomplished artist also; a painter. I paint and even sell them for a good price. So, that relaxes me and cooking also relaxes me, and I have twins – two-and-a-half-years-old, so that’s what I do with the rest of the day. (Laughs) It’s good. I’m very lucky and happy. Sven Bode: Just that I’m a good person. I don’t like to cheat anybody or harm anybody. And I also want to be successful. I always try to see the good in people and act like it. Sven Bode: (Laughs) That’s a hard one. With any business there’s always something. I have to be the person that’s putting out fires that may occur, and that’s with any company. Nobody can tell me it never happens to them. If someone makes a mistake, I have to be the one who soothes the ache, you know? (Laughs again) That keeps me up at night sometimes. You are currently browsing the Mr. Magazine blog archives for January, 2018.